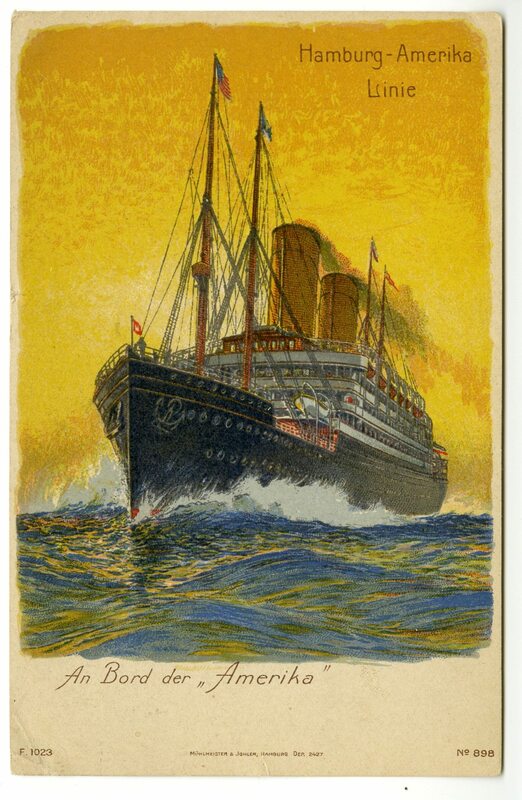 I have an unusual fascination with ocean liners. I think it stems from finding a book on the Titanic when I was twelve. All of the items below I’ve bought at “paper and postcard” shows or antique stores in the southern California area. 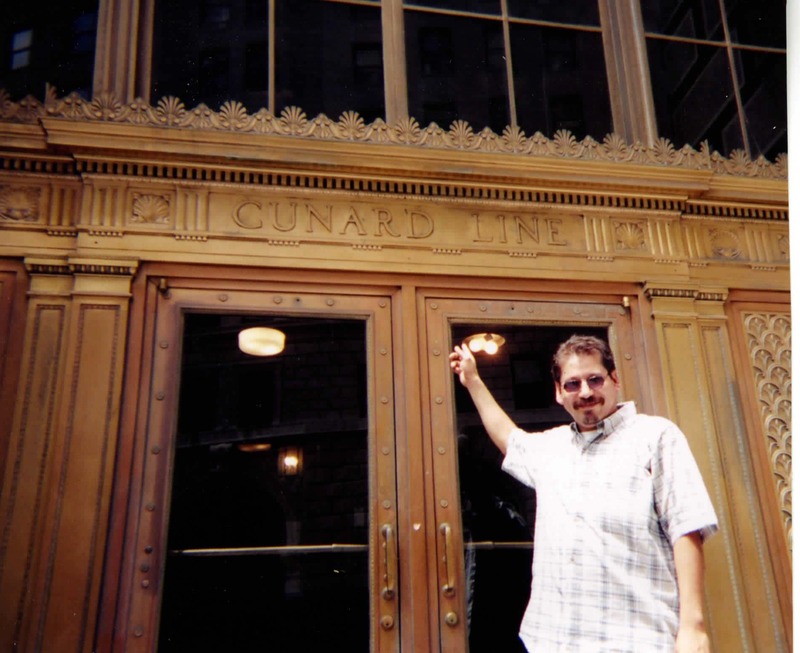 I’m outside the Cunard Building in NYC. 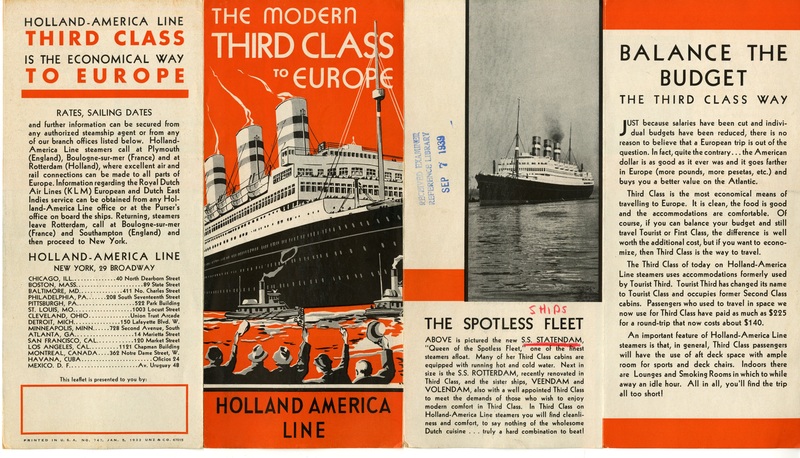 For somebody who likes ocean liners this was a great day for me. 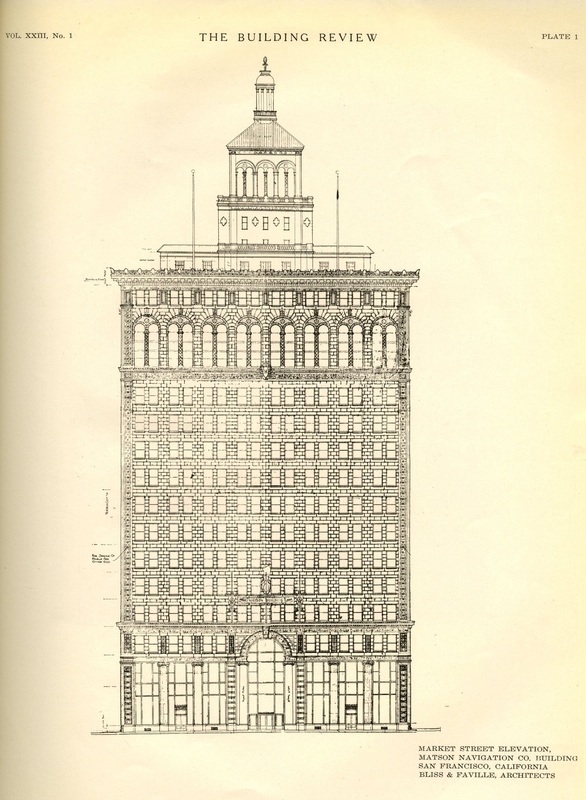 The architects of this building were Benjamin Wistar Morris and Carrere & Hastings. 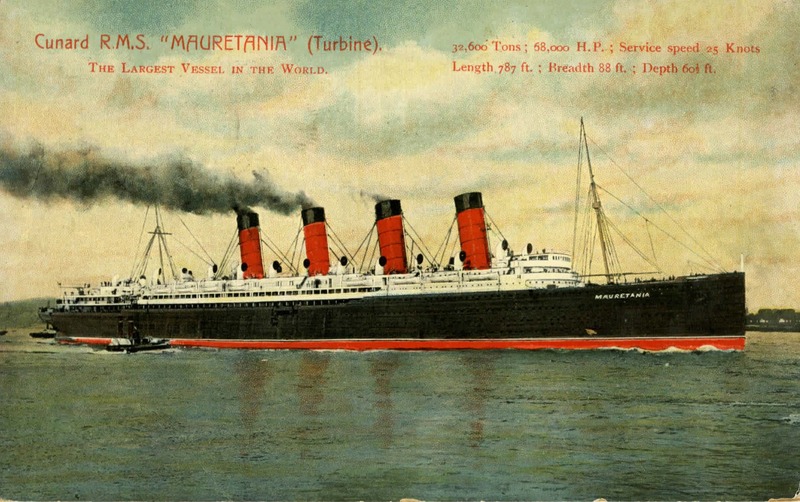 This is the first Mauritania (with 4 stacks) from 1907. 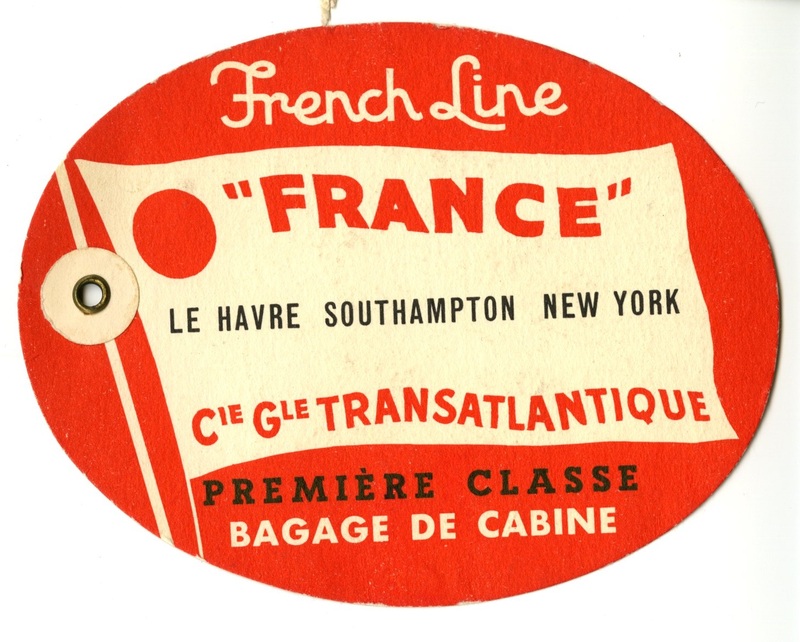 It’s a baggage label for the France. 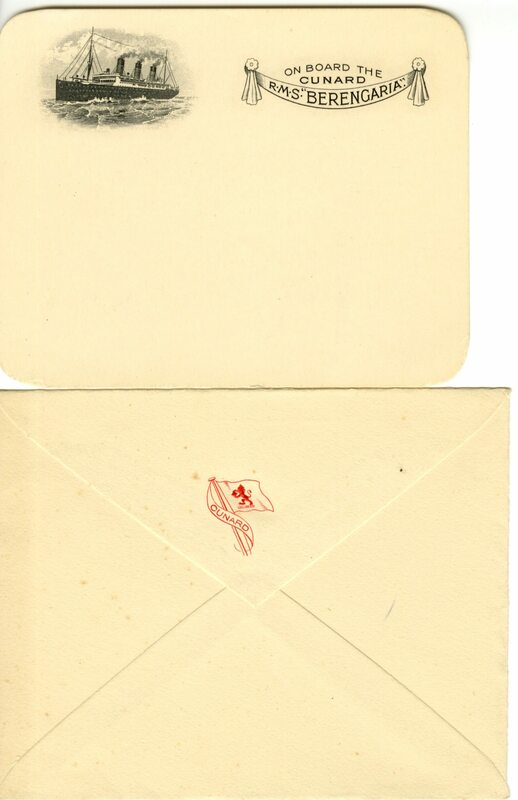 This is part of an envelope from the Cunard Line. The envelope was torn to take off the stamp but I still bought it. The discarded remains are the real treasure. 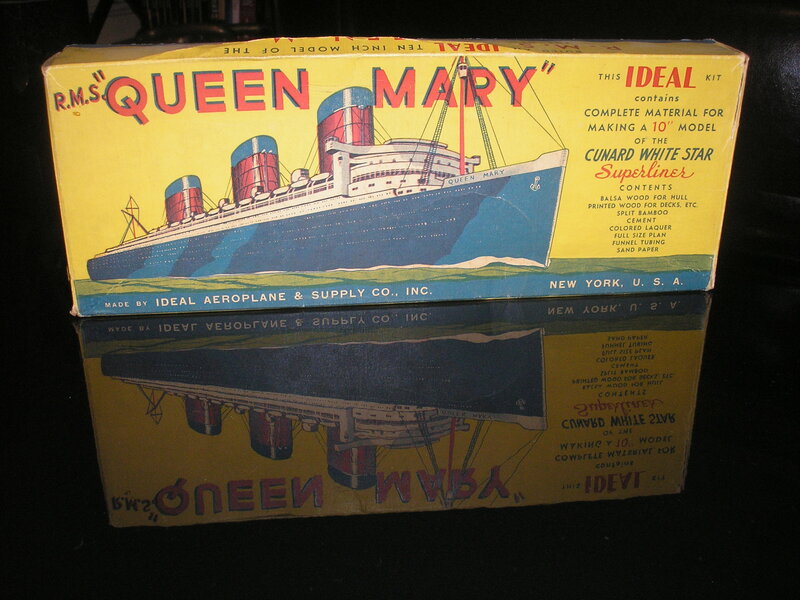 I was at an antique mall and a dealer overheard me say I was interested in ocean liners. He looked at me and said, “I’ve got some stuff in the back, that I haven’t put out, that I can show you.” I followed him to the storage area and he pulled THIS out of a clear, plastic, storage tote. That is one amazing box. When we opened the box up — these were the contents inside. It appears as if everything is there except the glue. Okay, what kind of a crappy gift would this be? 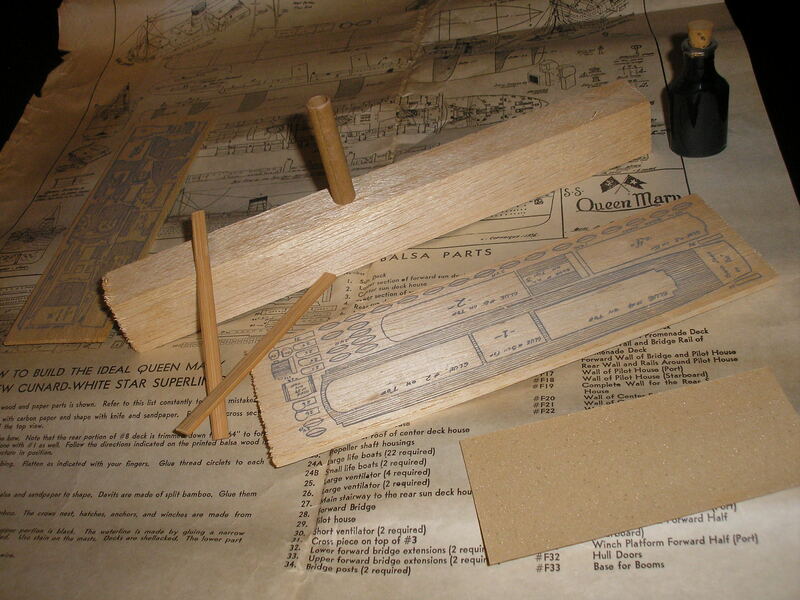 You have to make your own Queen Mary. If you gave it to a kid you would have to give them a KNIFE too so they could whittle out the hull. This certainly wouldn’t pass safety standards today BUT, of course, I had to have it. I bought it on the spot. I like the color. 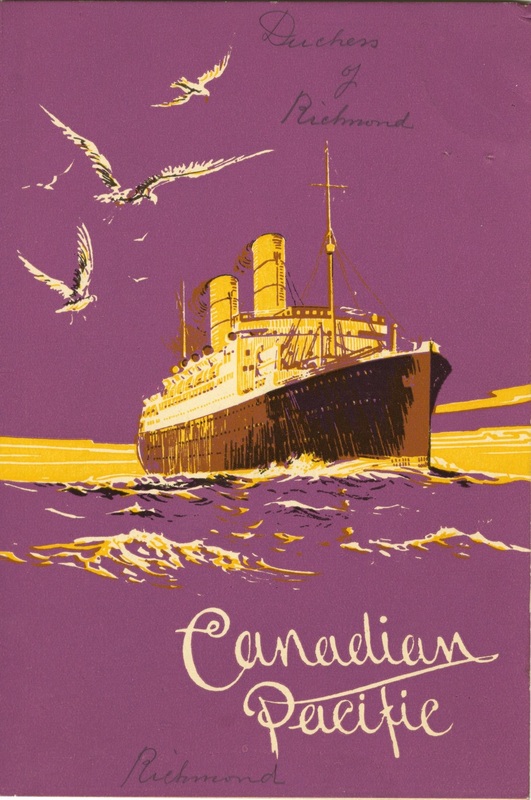 It’s a dinner menu from May 19, 1935 for a ship called The Duchess of Richmond. 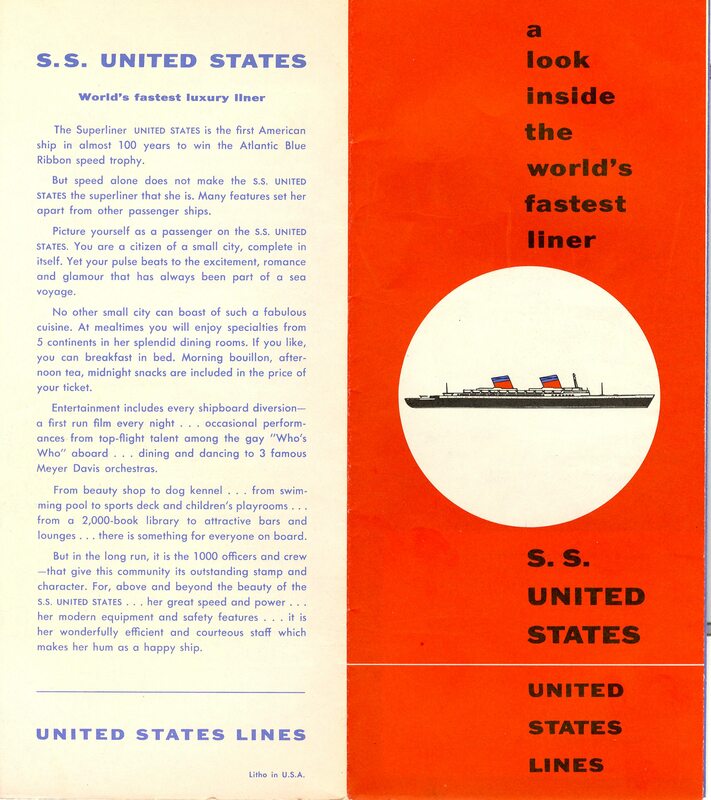 The S.S. United States is referred to in this brochure as a superliner. 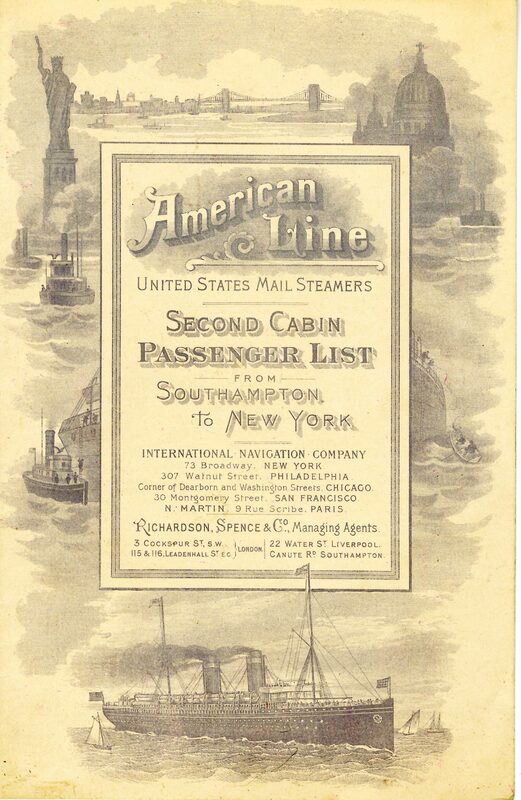 In the S.S. United States brochure there is information about the ship and the Blue Riband. 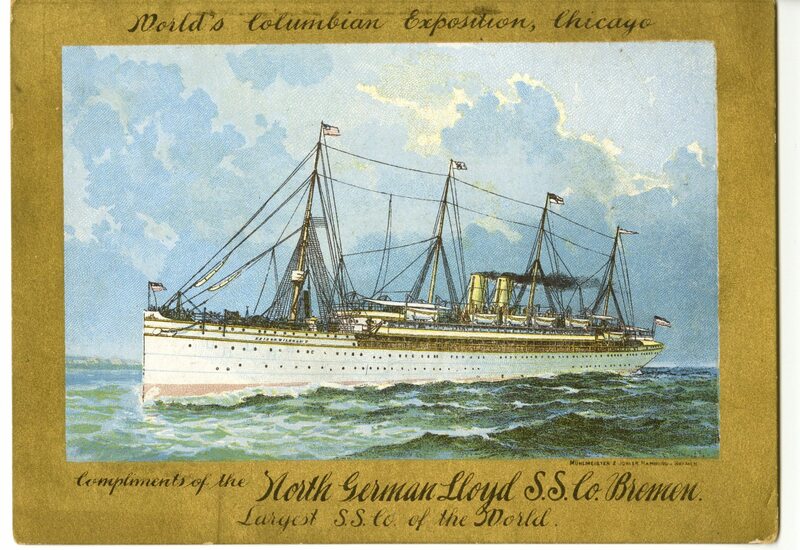 The Nieuw Amsterdam. 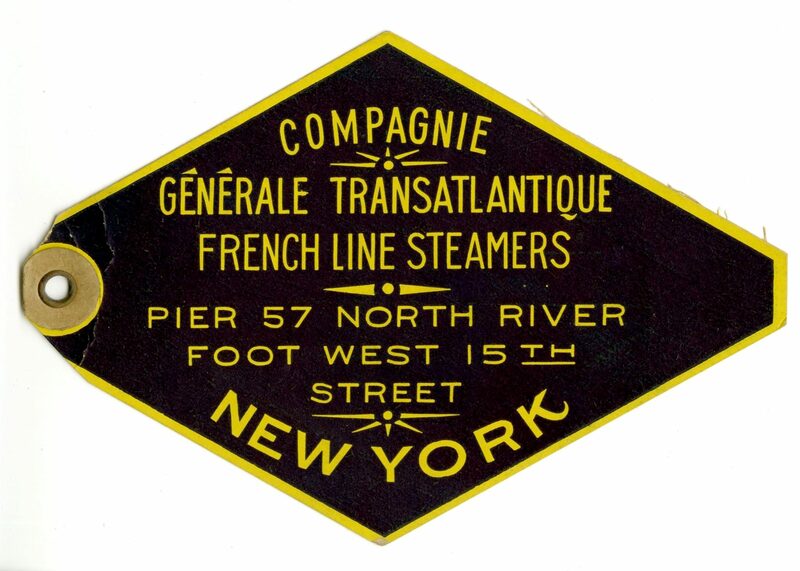 It was so modern and up to date when it went into service back in 1938. 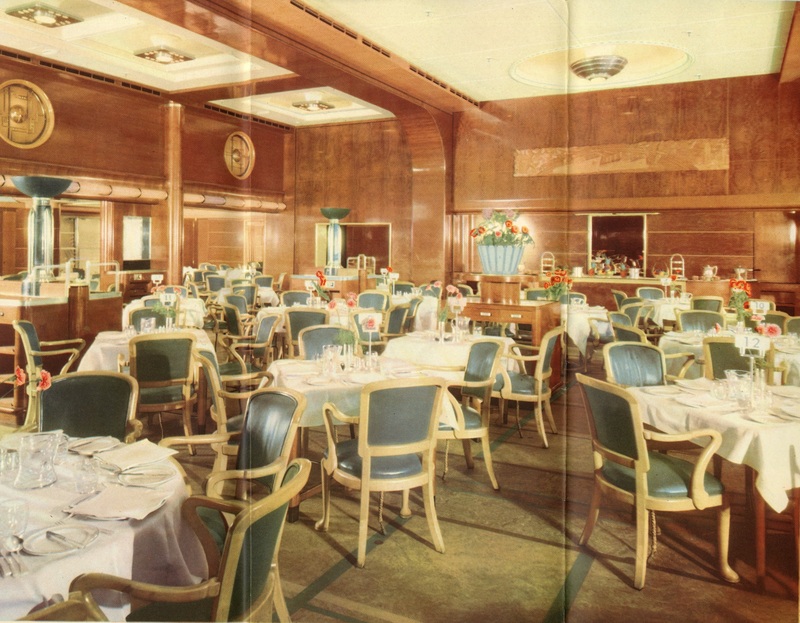 The Nieuw Amsterdam dining room with a fantastic padded & tufted ceiling. Flandre. 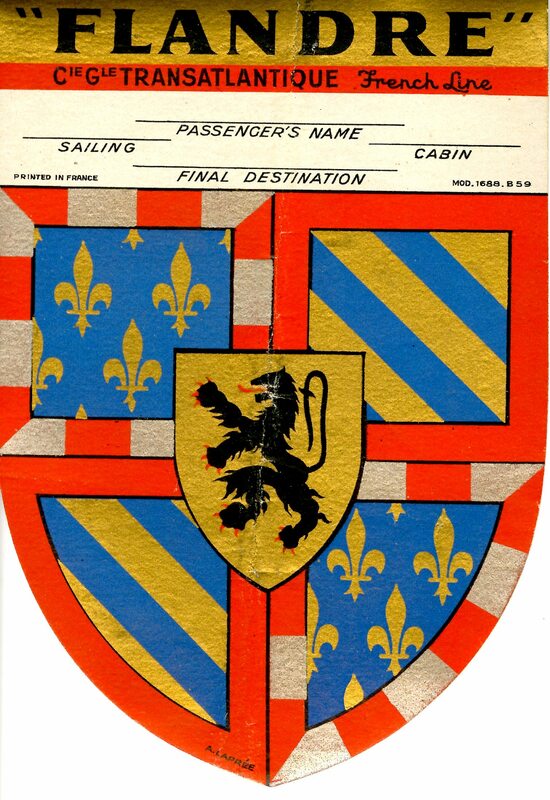 This baggage label has seen better days but it looks royal and has a family crest thing going on. 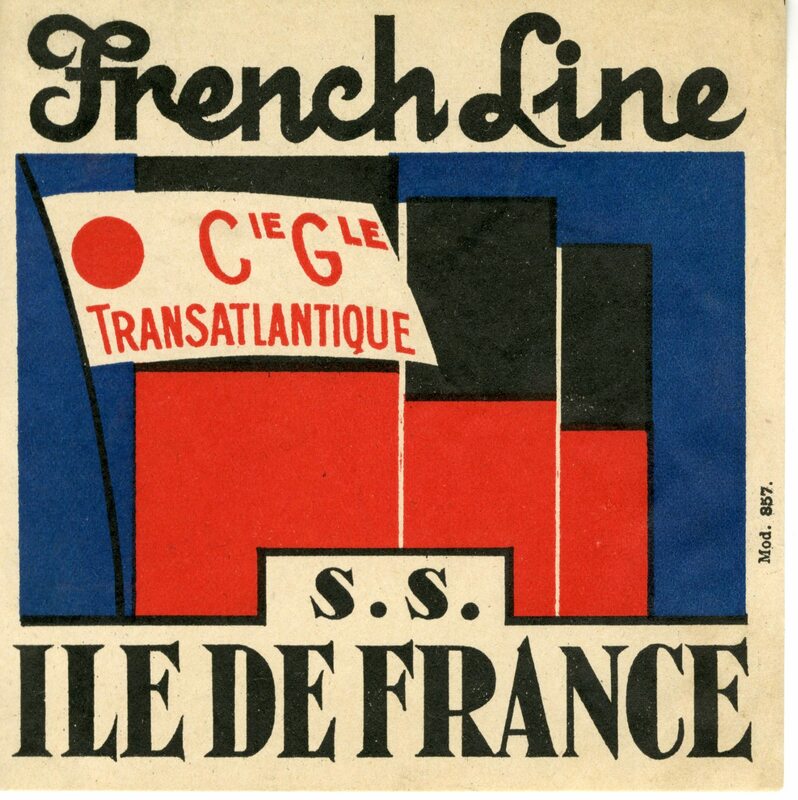 Another cool baggage label but this time from the Ile de France. That’s a fleur de lis. 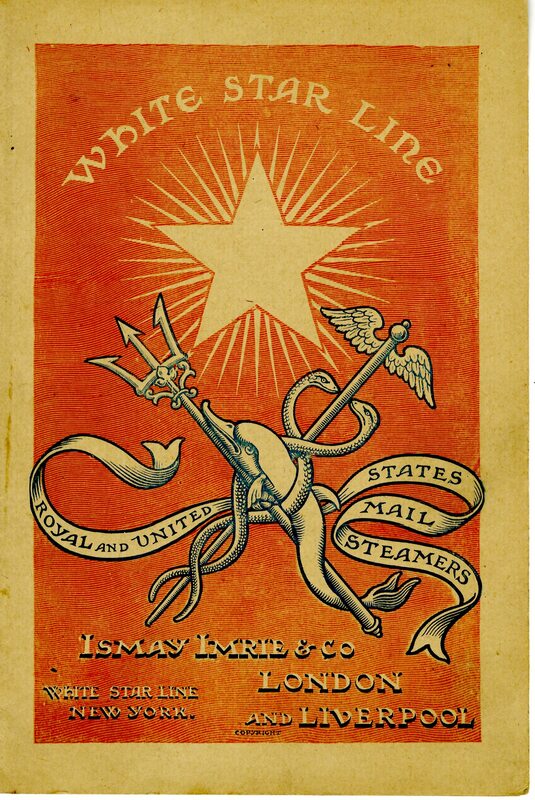 The cover for a White Star Line booklet concerning their ships. 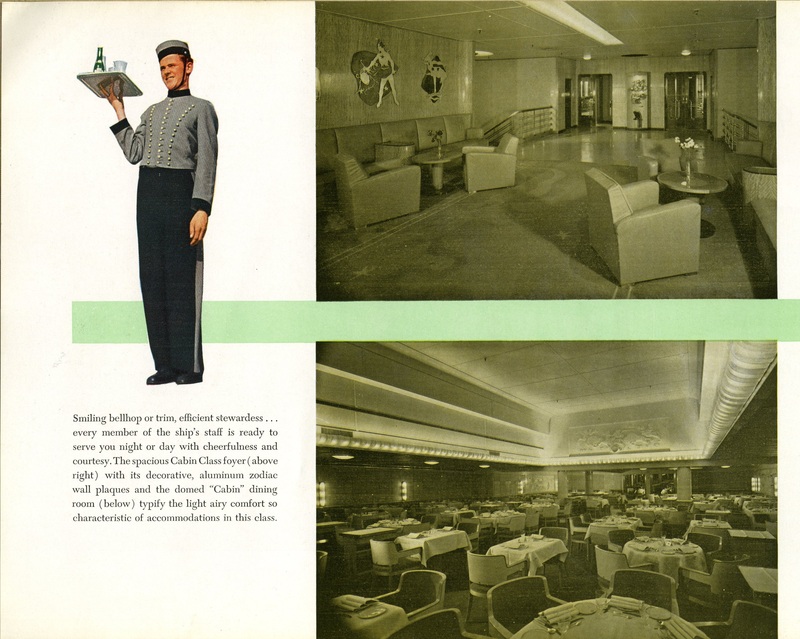 Here’s the inside of the White Star brochure. The paragraph on smuggling seems stern. 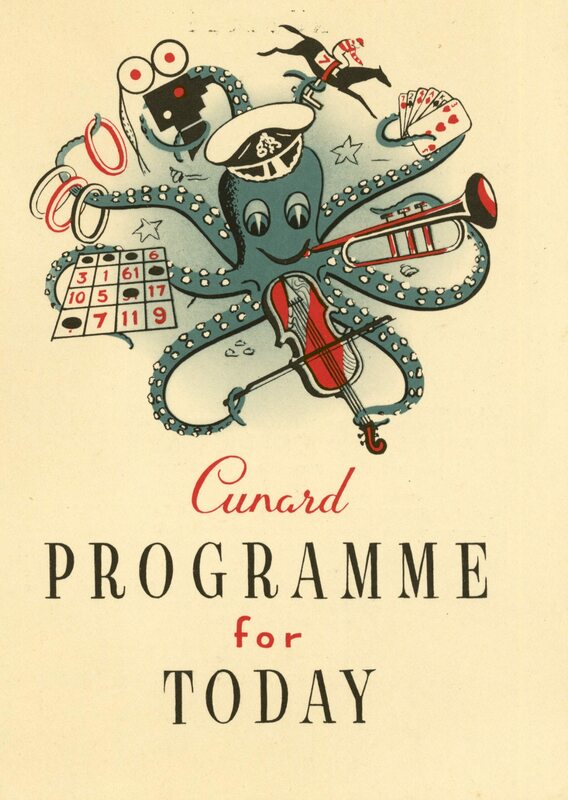 Another great graphic from the Cunard Line. 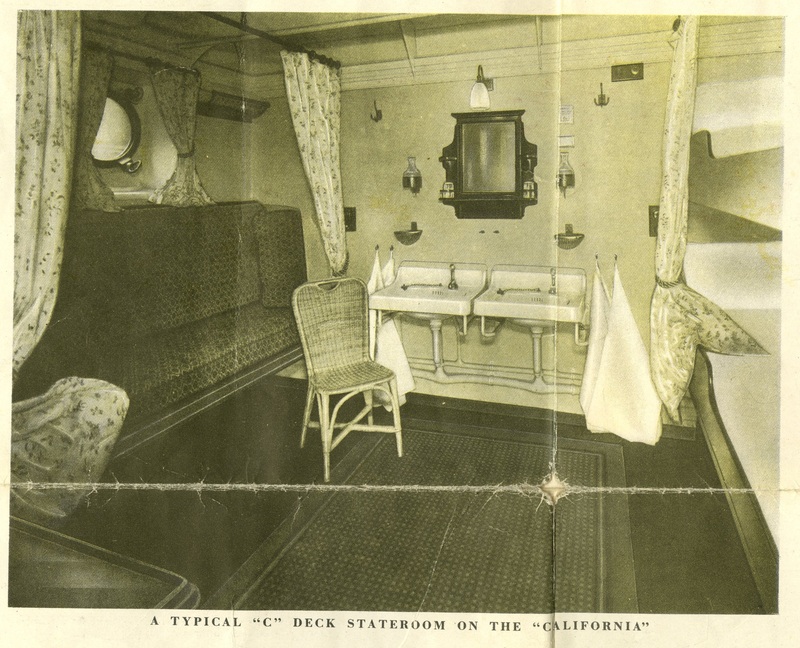 How fabulous would it be to sail on the S.S. California in January of 1929. That pesky stock market crash was still months away. Photos from the California. I would spend all my time here since it’s the “man’s room.” The fact that it’s a smoking room too is just an added bonus. Another photo from the California. 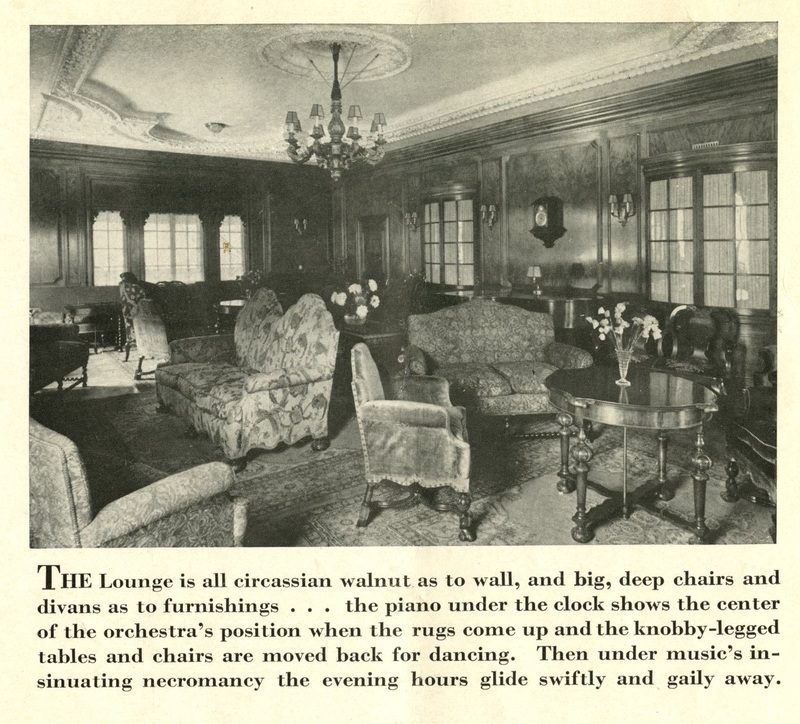 The text under the photo says that when the furniture is pushed back to the walls — dancing can take place but the room doesn’t look big enough for dancing to me. 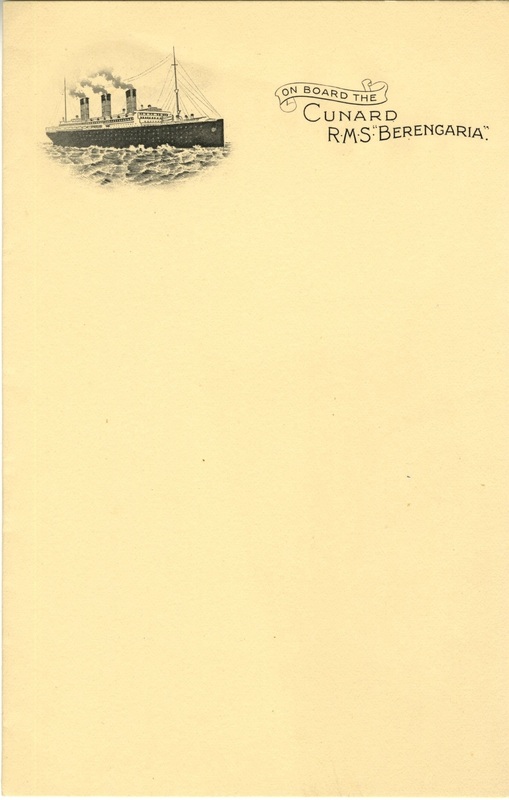 I like this tinted photograph of the ship. 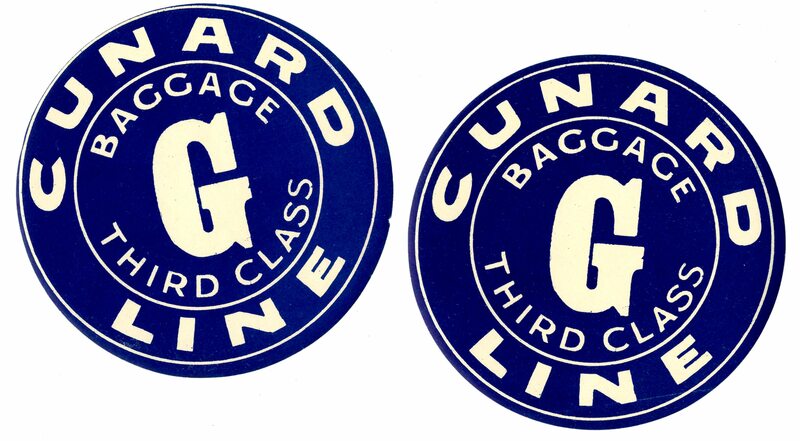 These third class luggage labels are very nice in their simplicity. 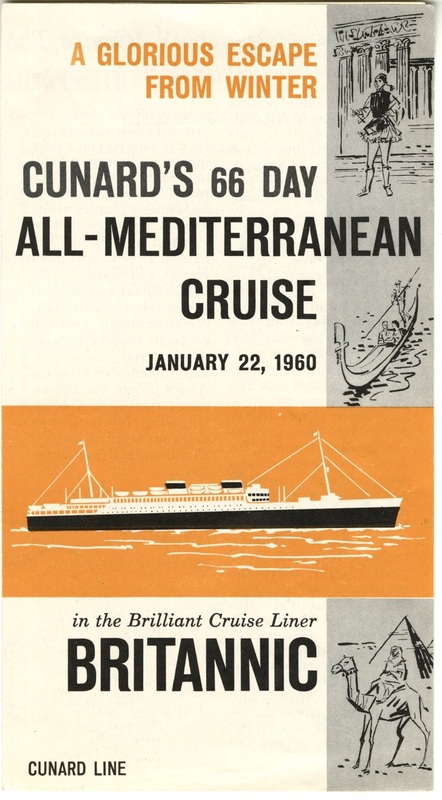 This booklet is for a cruise through the Mediterranean and on to Istanbul and Egypt. 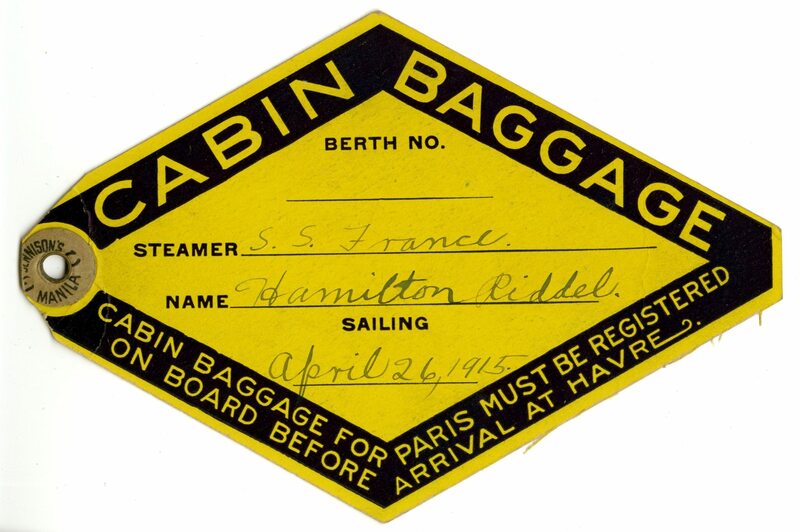 It left two and a half months before the Titanic sank and arrived back in England on the day the Titanic sailed. 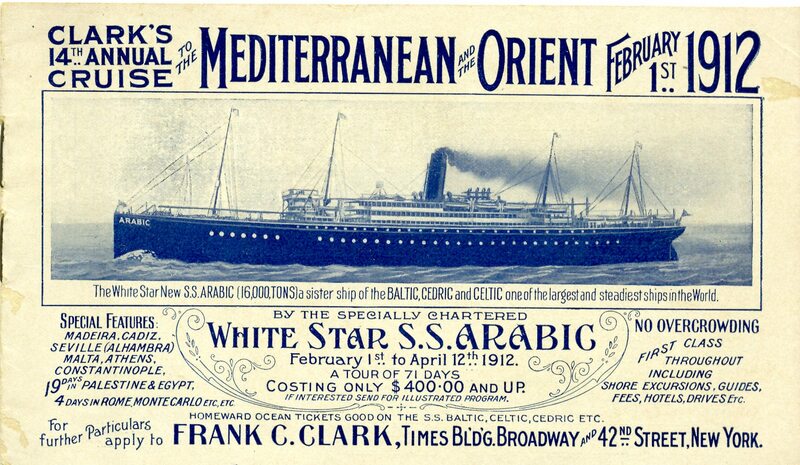 The Titanic was also a White Star Line ship. 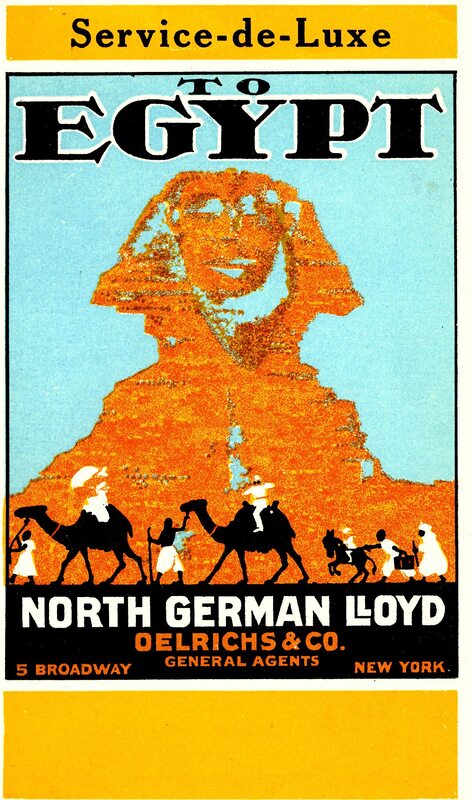 I’ve always wanted to go to Egypt so this German Line advertisement appeals to me. 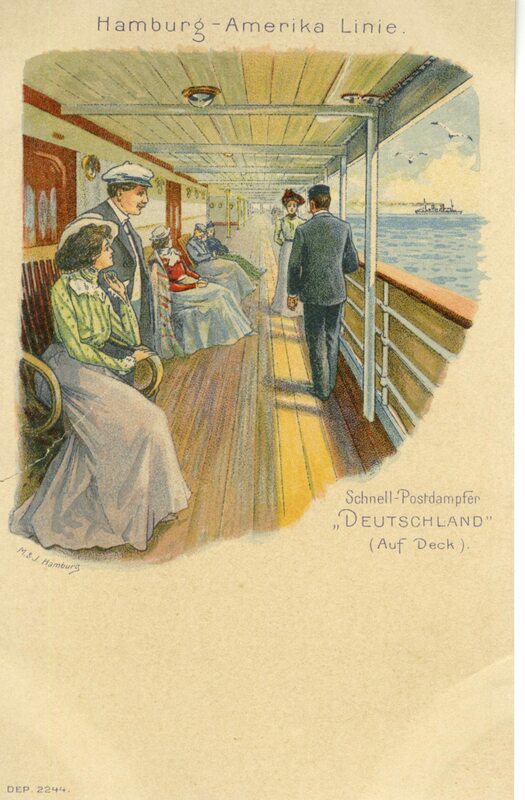 It’s a lunch menu from the German line North German Lloyd. 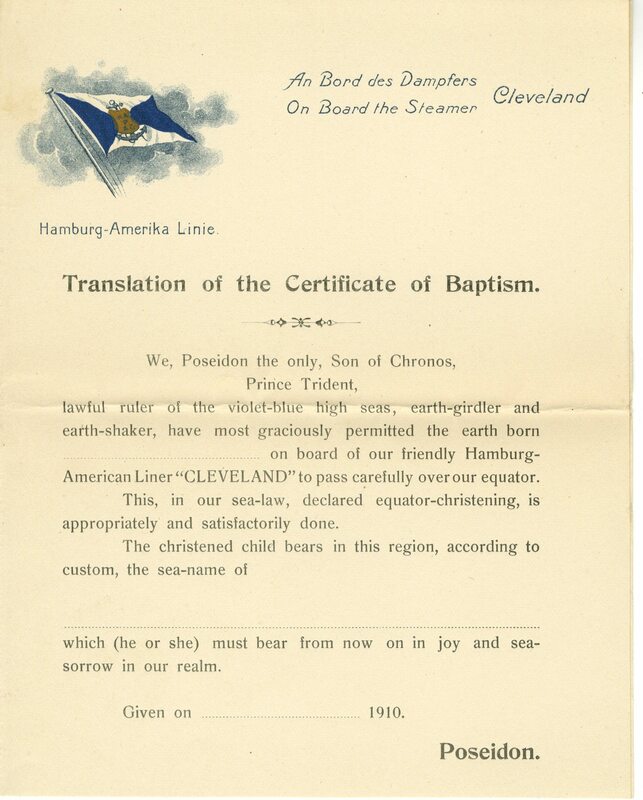 It’s in German and English and dated March 14, 1904. 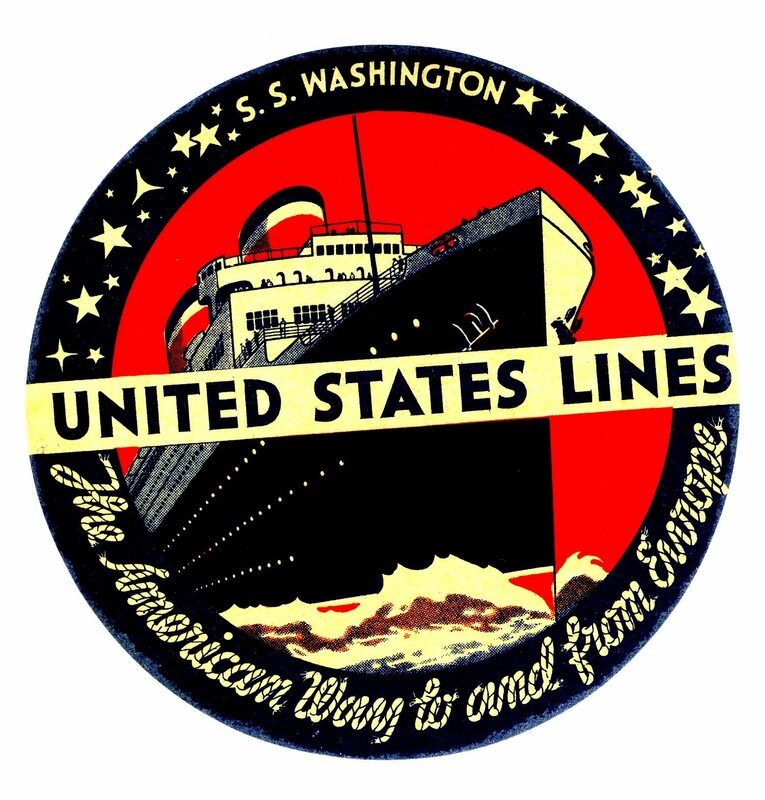 The S.S. Washington was launched in 1932 and scrapped in 1965. It’s a nice baggage sticker. 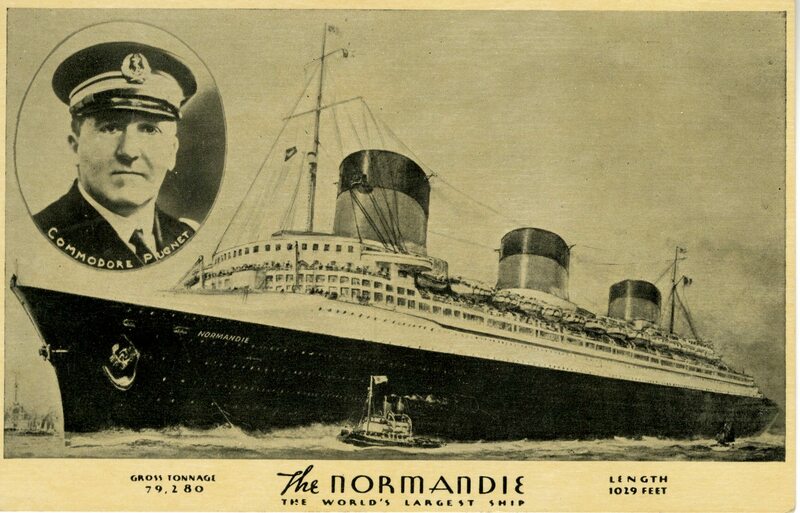 One of my best friends likes the Normandie. 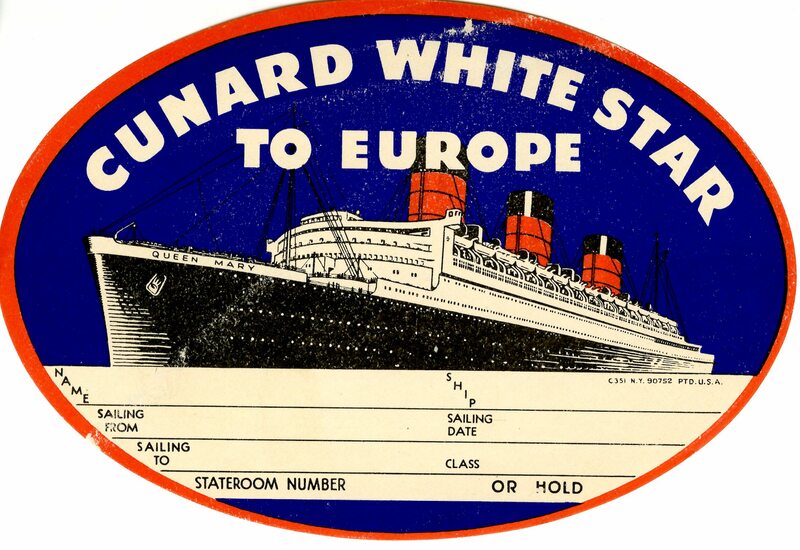 A Cunard baggage label with the Queen Mary. 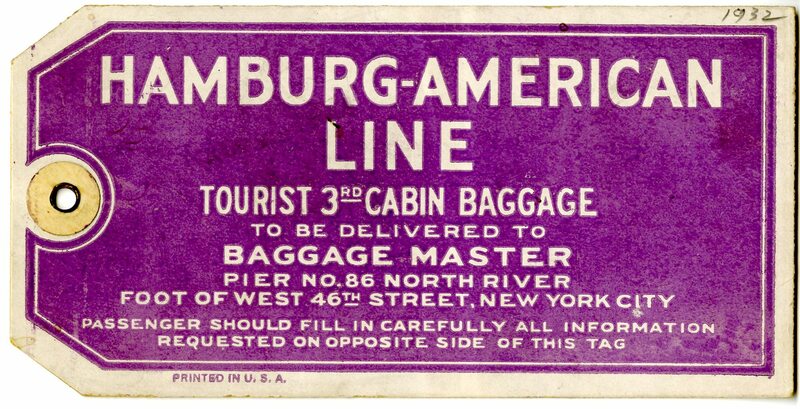 Evidently, crossing the equator was a big deal on an ocean liner. 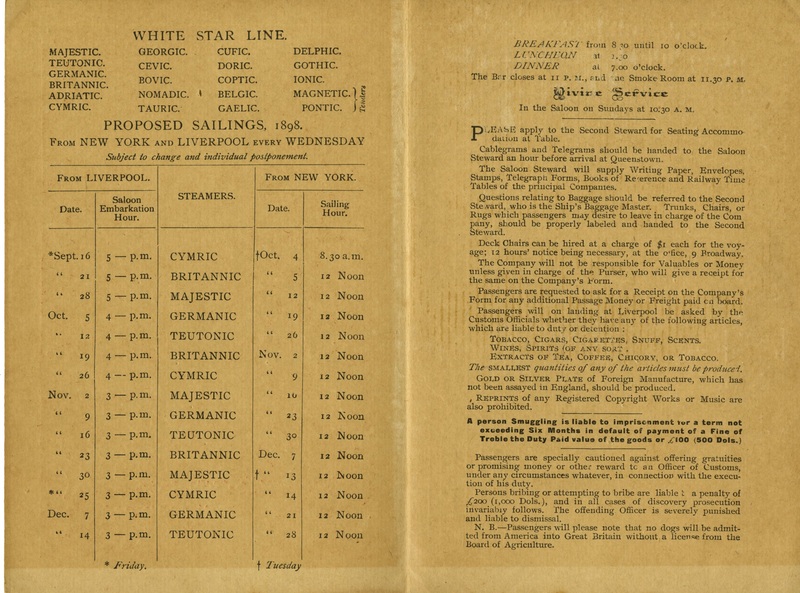 This document is from 1910 and the person who officiates over the proceedings is Poseidon. That bunny is going to eat the ship. 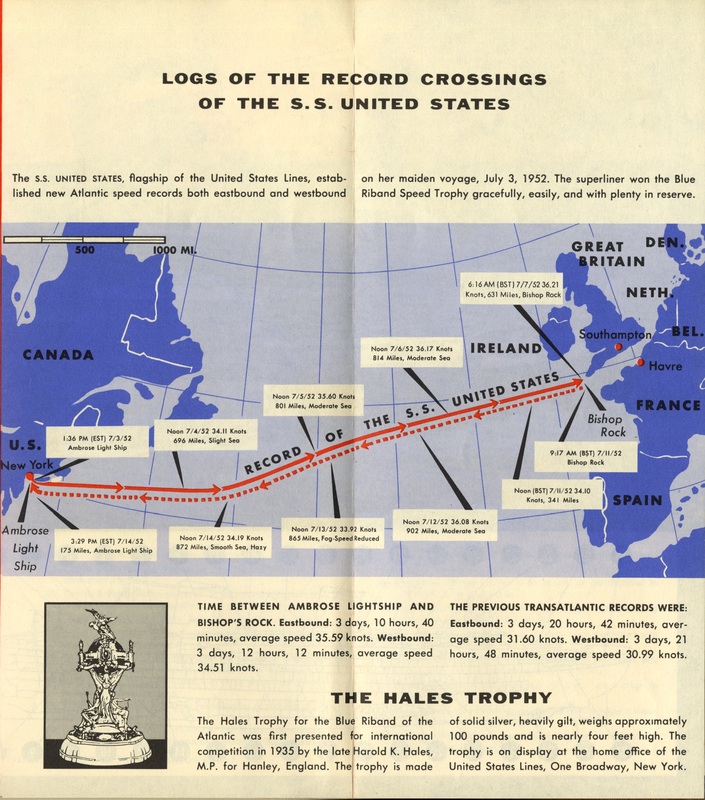 This is a sailing schedule for the United States and the America. 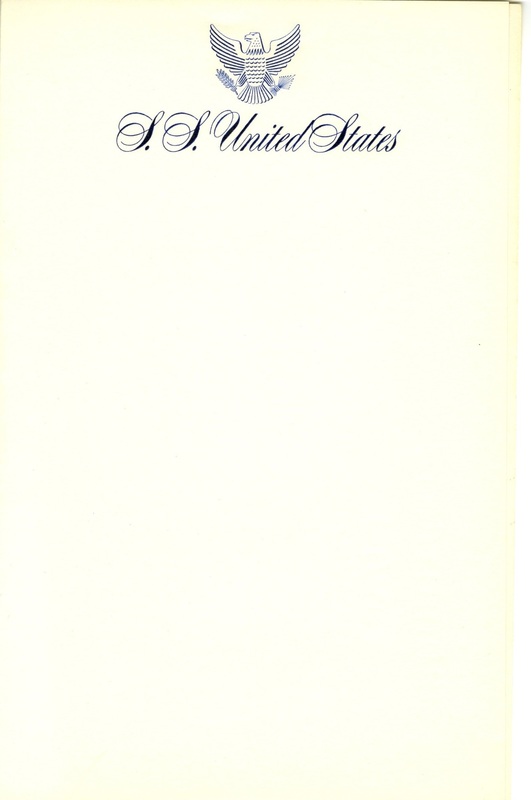 These are the listed rates for the United States and America in 1963 and 1964. 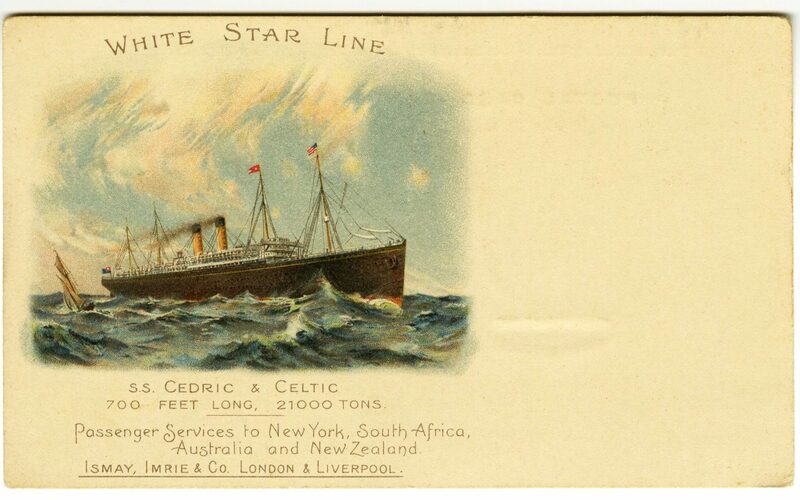 I don’t see a lot of items for the Britannic so when I stumbled upon this I snatched it up. On the inside it states that rates start at $1,275. 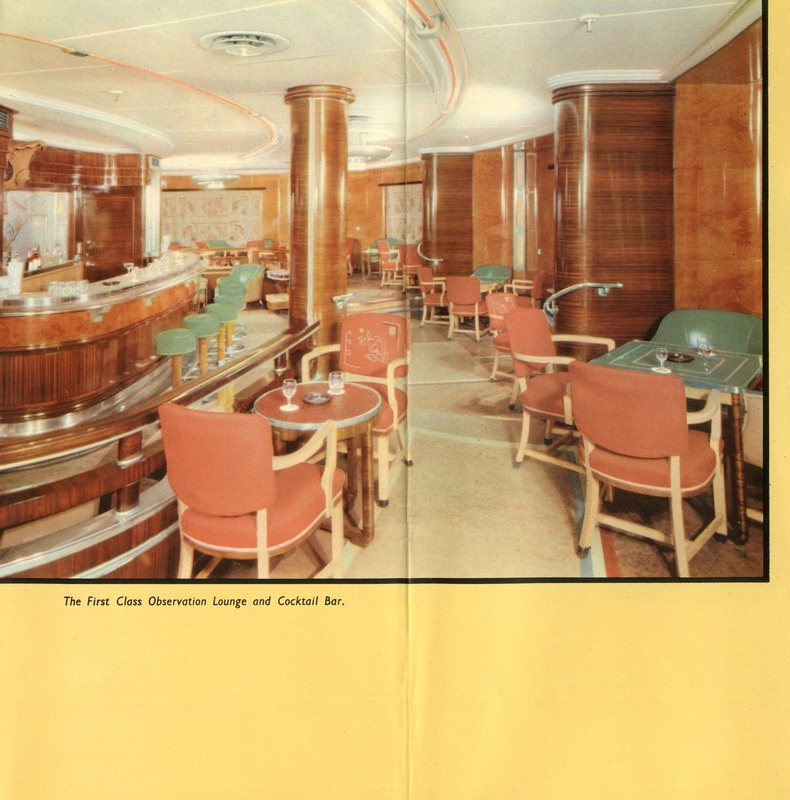 This is from inside the Britannic brochure. It’s the route the ship would take. The first stop is Madeira. This is the outside. It’s the size of a regular postcard. 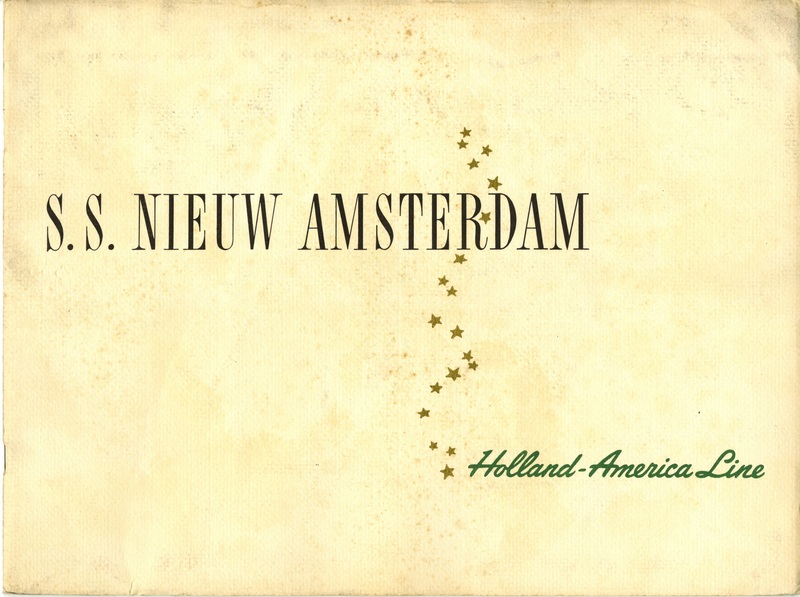 This is one beautiful postcard. It’s from 1898. 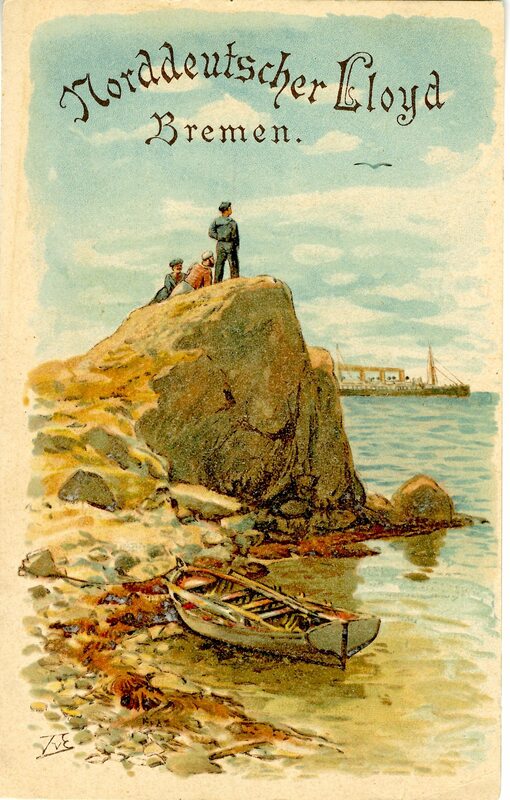 This postcard was sent in June of 1910. I’m sure it was named Amerika to attract immigrants. 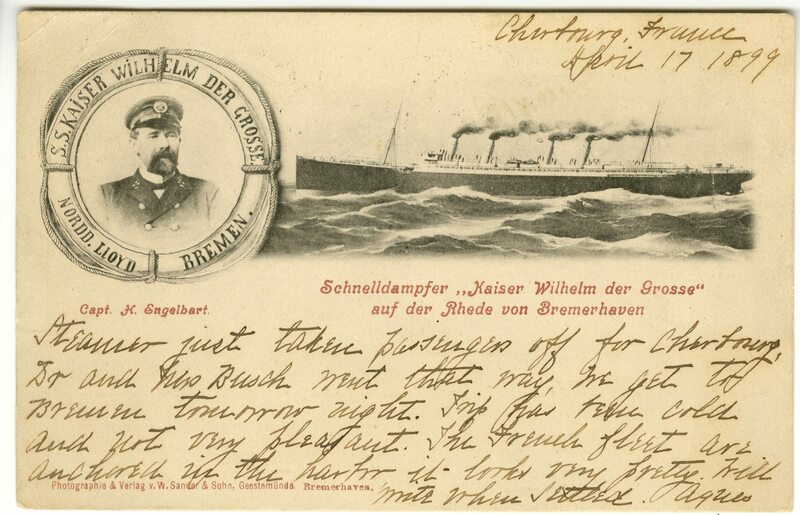 This ship is from the German Line. 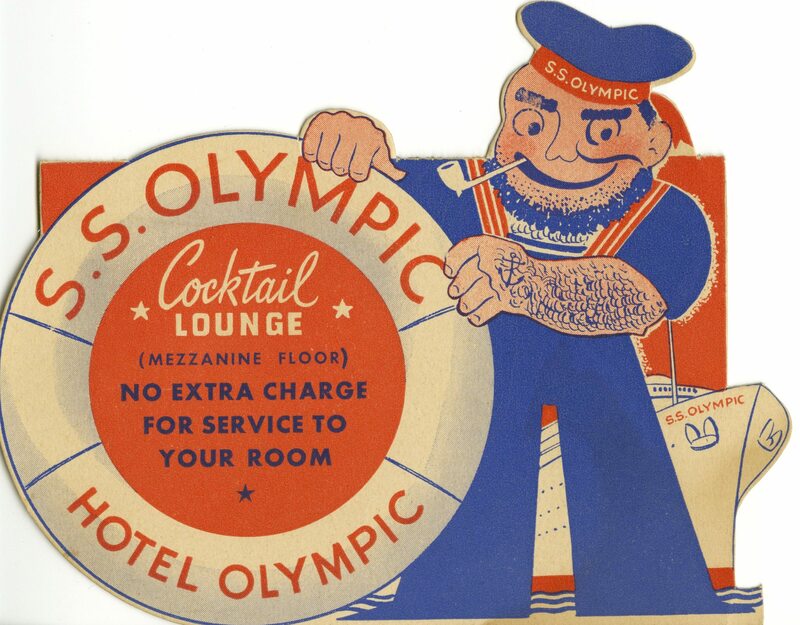 I don’t know how exactly this sailor relates to the Olympic but I like him nevertheless. 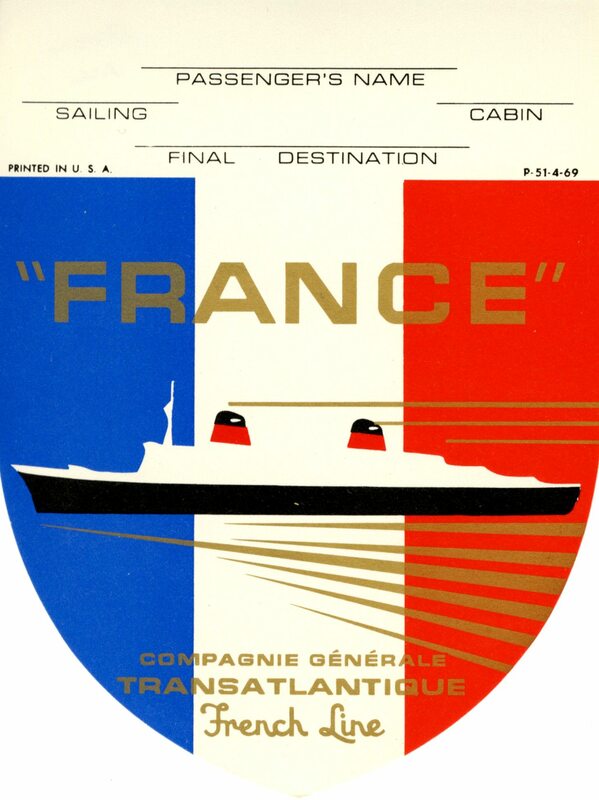 A colorful brochure from the French Line. Here’s what the ship looked like. 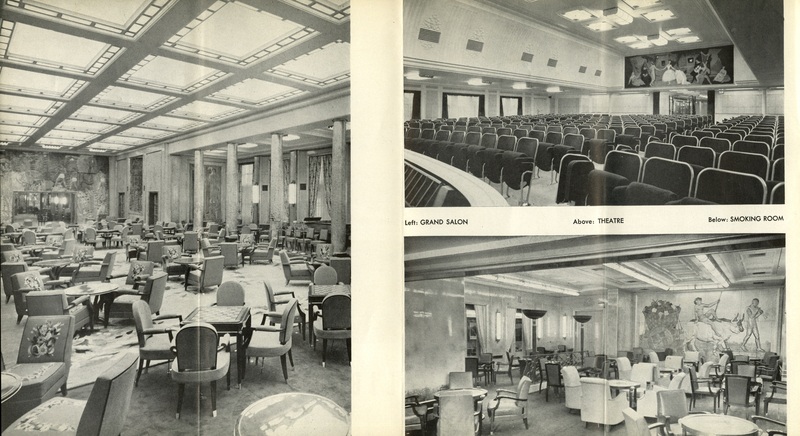 Some interior photos from the Liberte brochure. 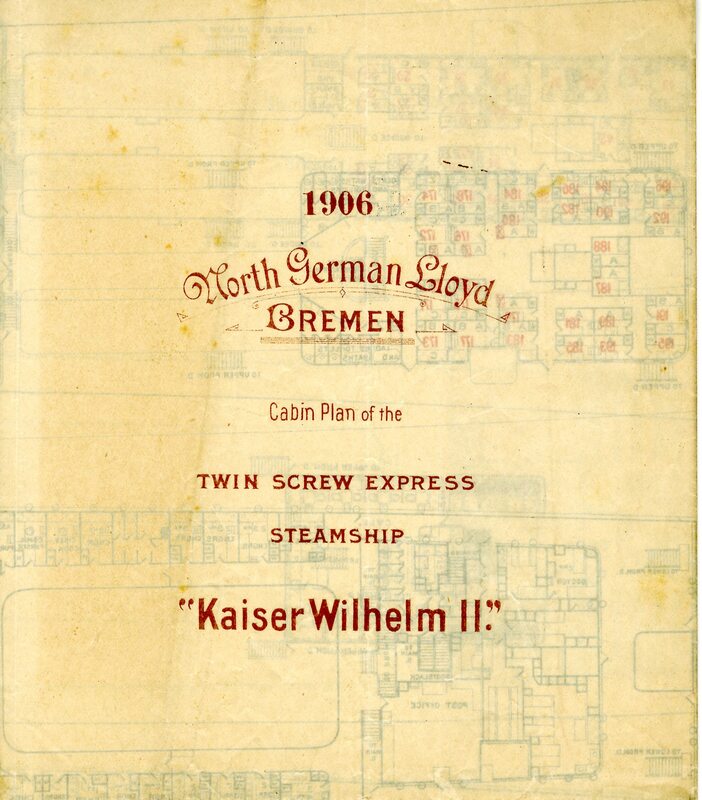 It’s the Kaiser Wilhelm II‘s cabin plan on some sort of architectural paper. It really should be framed. 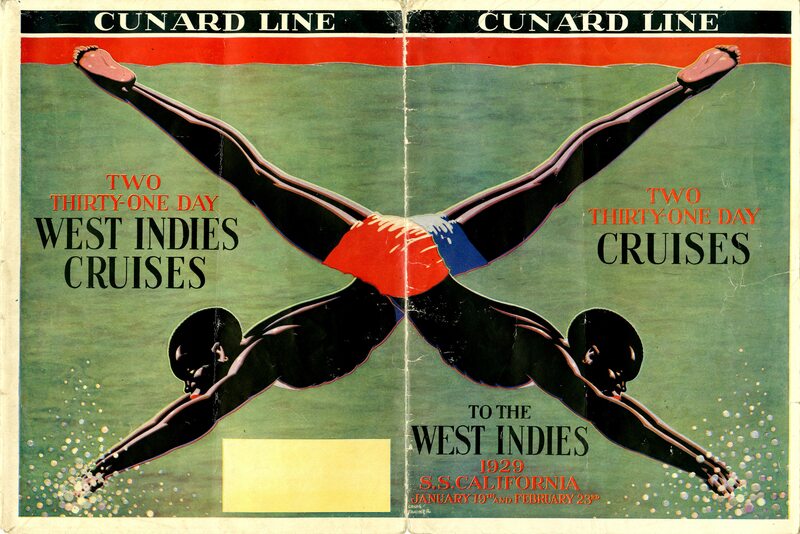 The American Line produced amazing cover graphics for their programs. 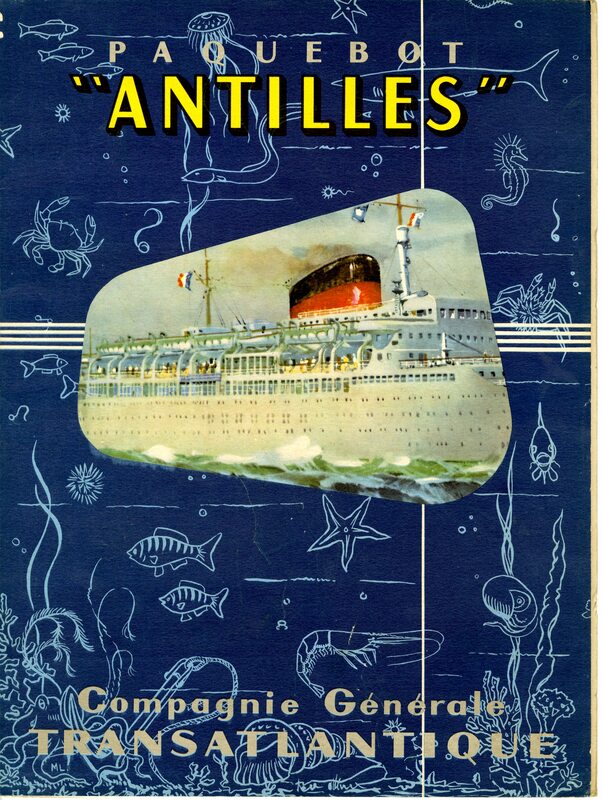 The name of the Ship is the Antilles. There are two things I really like about this cover: 1) all the marine life depicted on the cover and 2) isn’t the ocean liner under the water line? That doesn’t bode well. 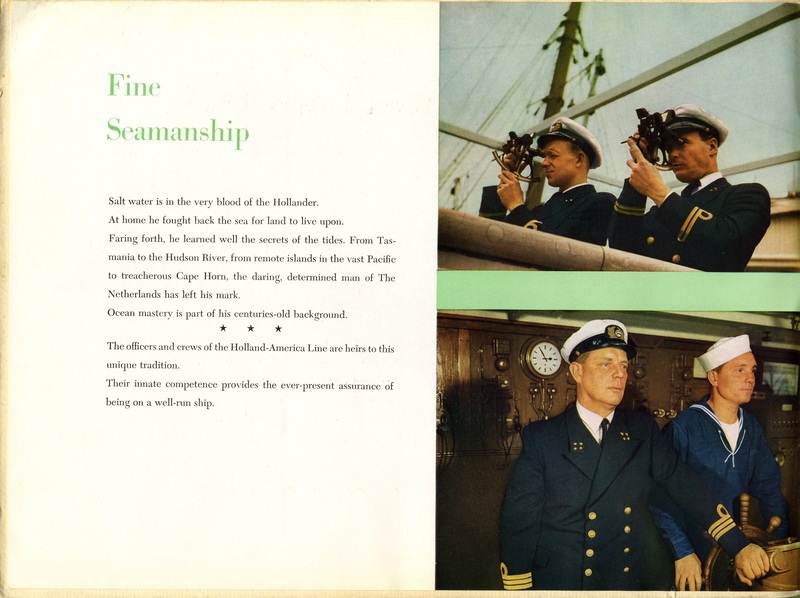 When you open up this very big brochure there is a diagram of the ship. It must be about 2ft by 3ft when completely unfolded. 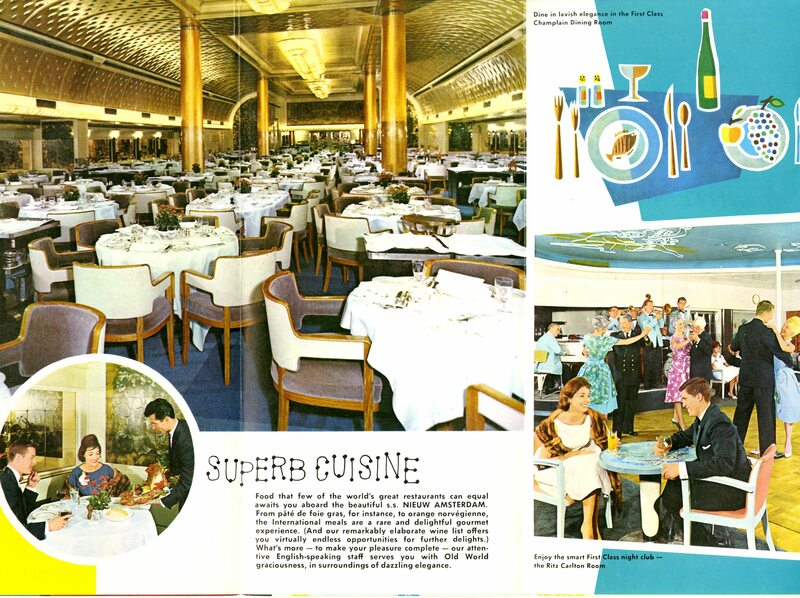 The following 4 images are from this Antilles brochure. 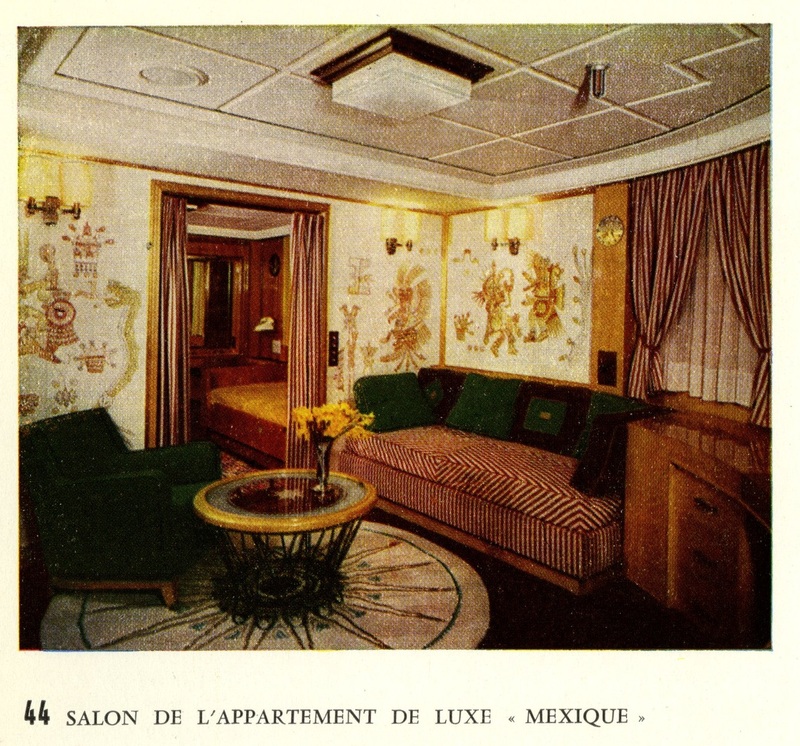 It’s the Mexico suite. What this room needs is a serape draped over the couch and a ceramic burro for the coffee table. The chapel. Evidently, they’re not expecting a big crowd. I like this cabin the best. 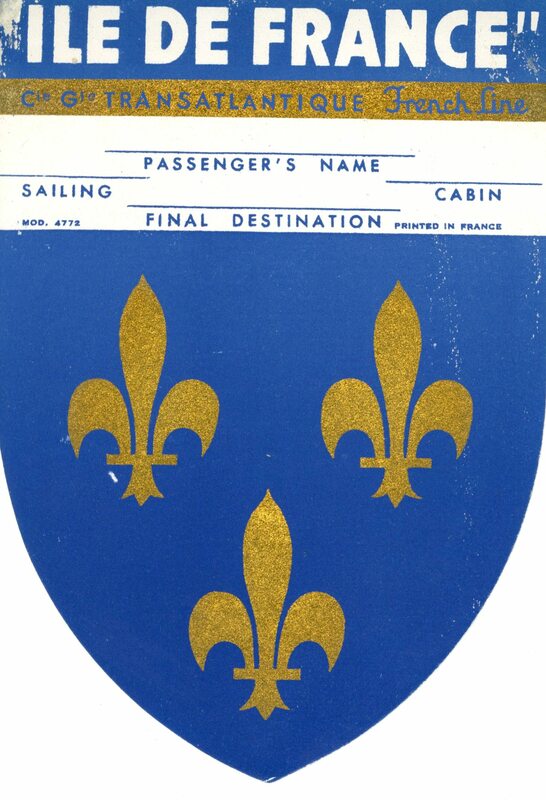 It’s a baggage sticker for the Ile de France. 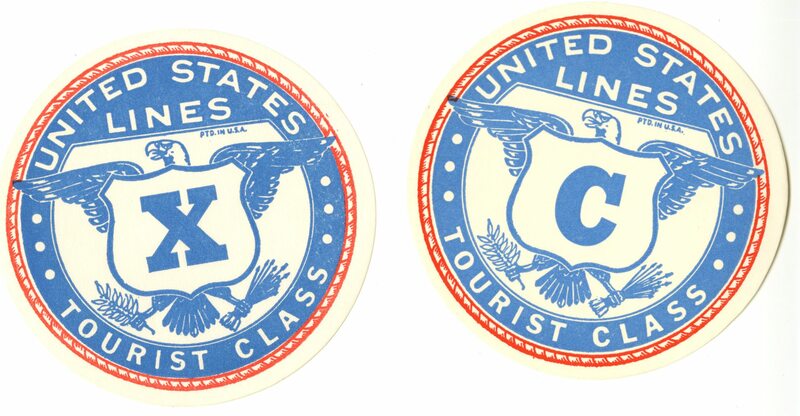 Some Tourist Class labels from the United States Lines. This is the other side. 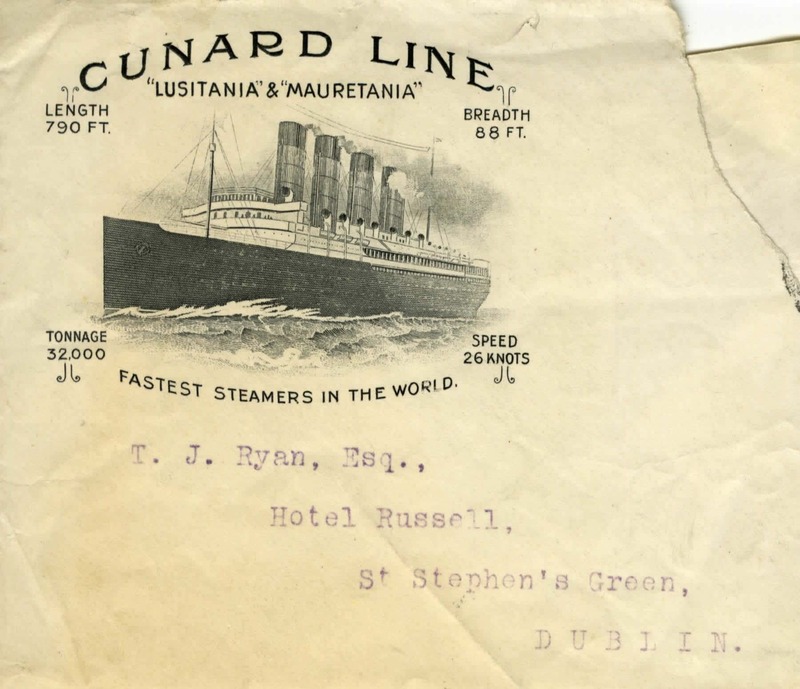 It sailed 11 days before the Lusitania sank. The Lusitania sank on May 7, 1915. 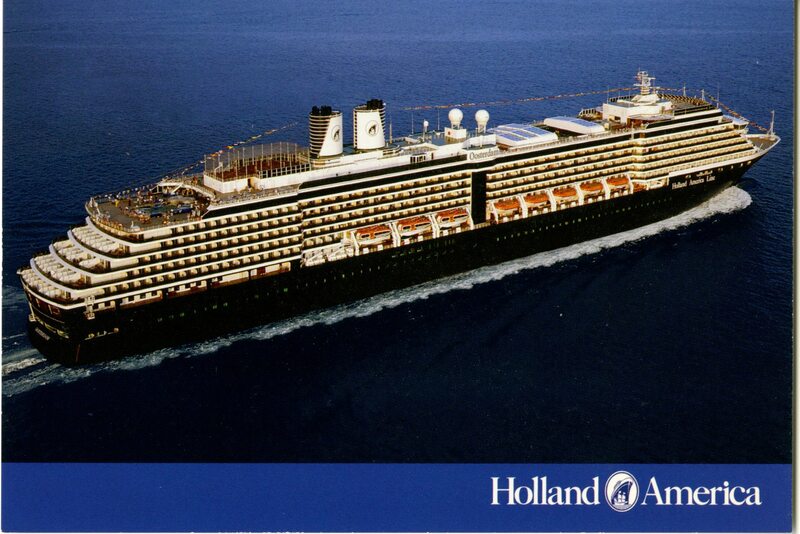 Five or six years ago my family went on a cruise on this liner — The Ms Oosterdam. It was one of the most enjoyable things I’ve ever done in my life. 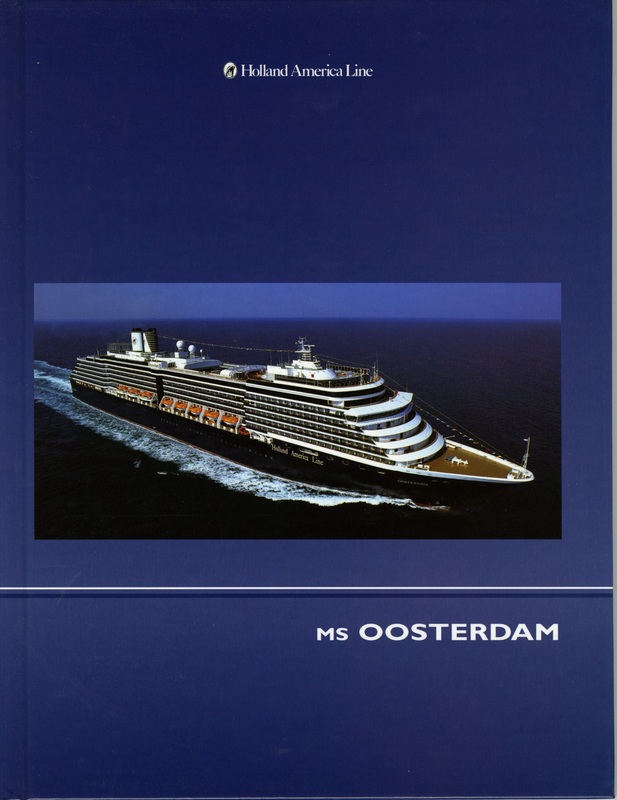 When I was on the Oosterdam I bought this 138 page book about the ship. 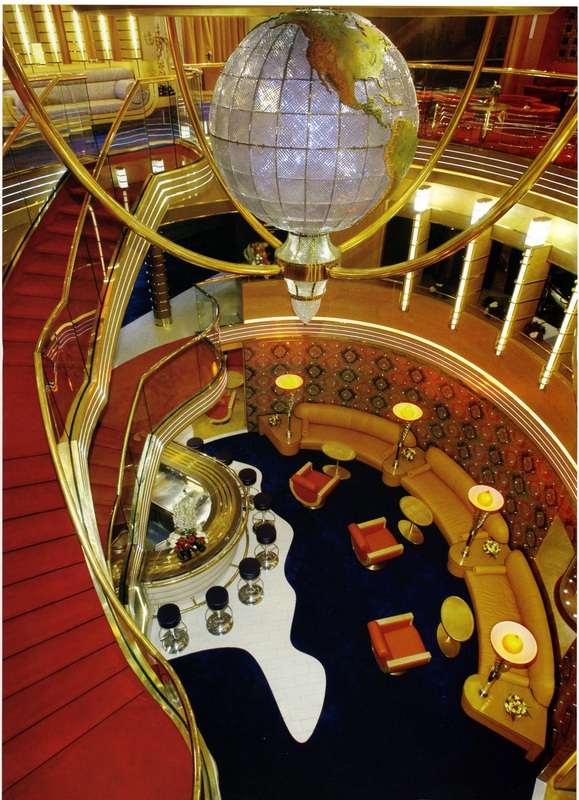 This is one of the staircases on the Oosterdam. It’s very glitzy. 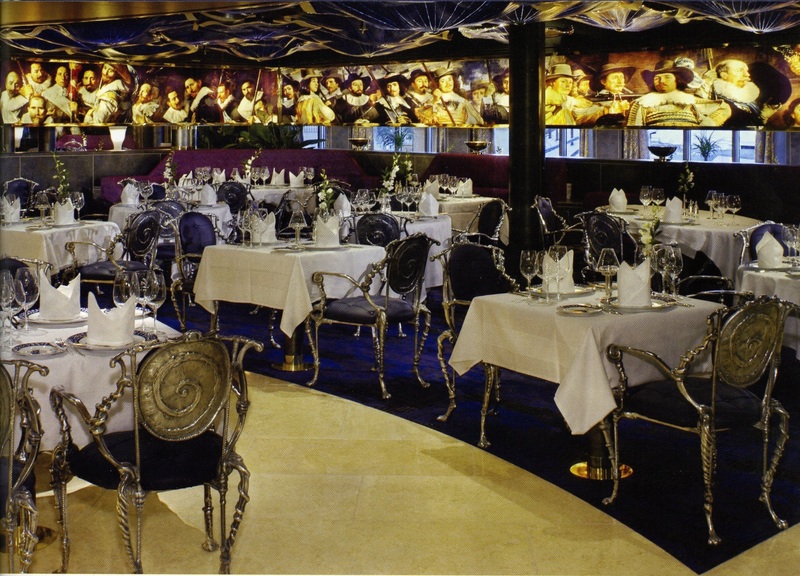 We dined in this restaurant while on the ship. It reminds me of Las Vegas. 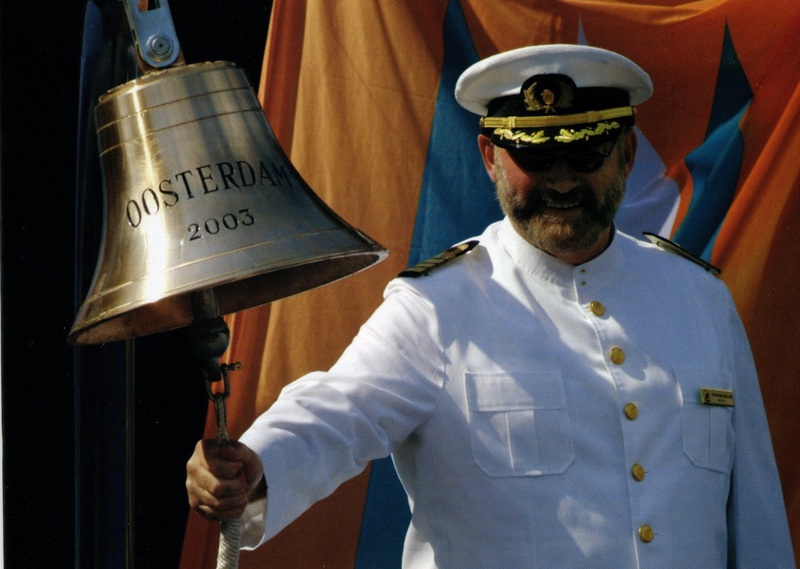 Captain van Biljouw was captain when the Oosterdam was launched. A give away from the Compagnie Generale. 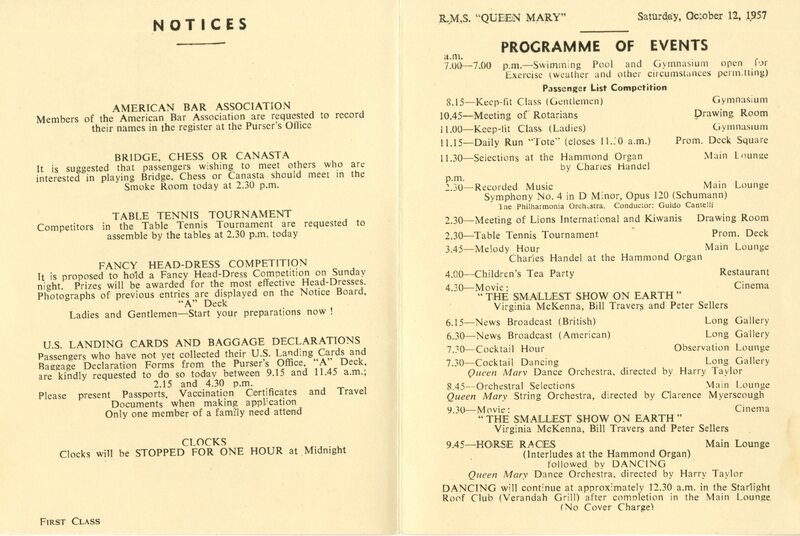 It’s a Cunard program for the Queen Mary. 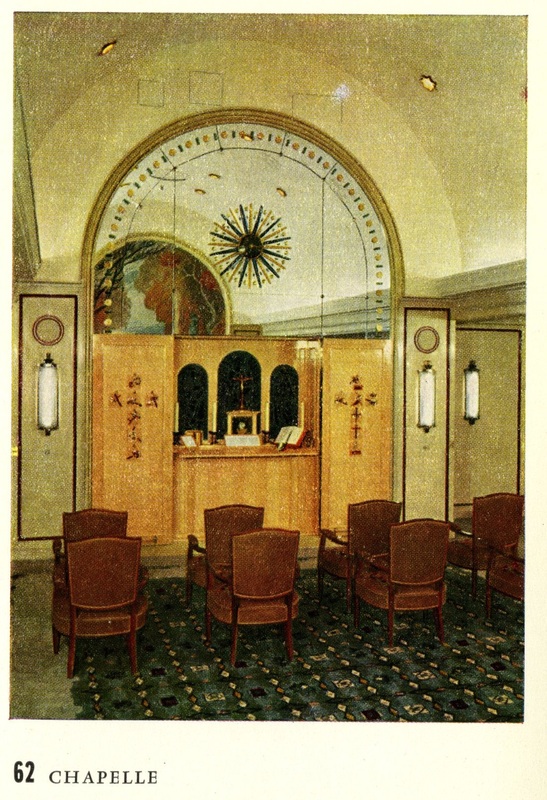 This is the inside of the Queen Mary Cunard program. 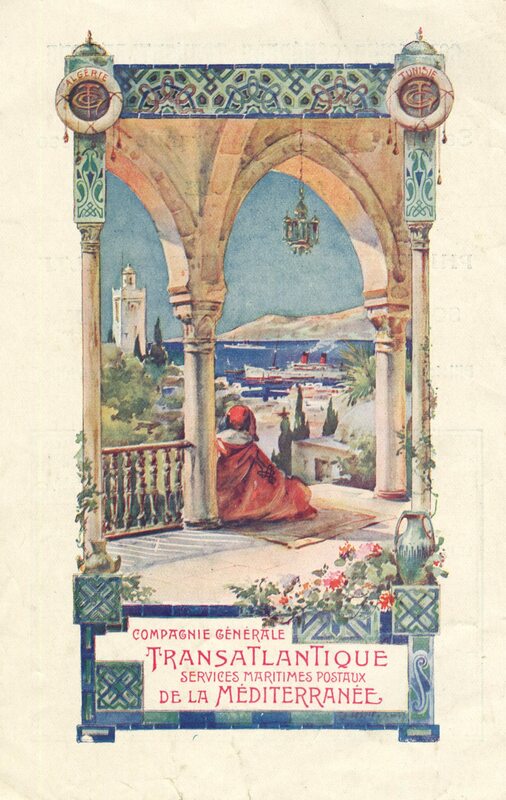 More stationary from the Berengaria. 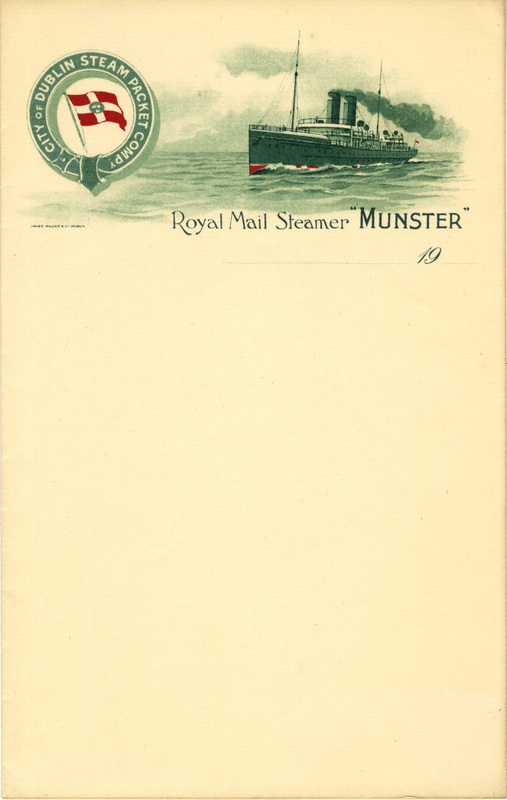 Royal Mail Steamer Munster stationary. Uh, how did they come up with that name? This brochure looks very patriotic. 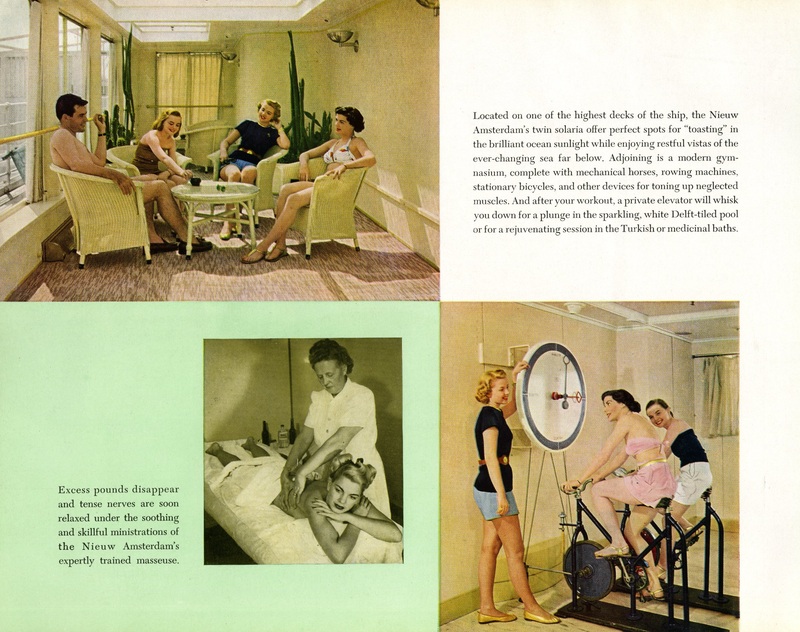 The S.S. United States was launched in 1952. 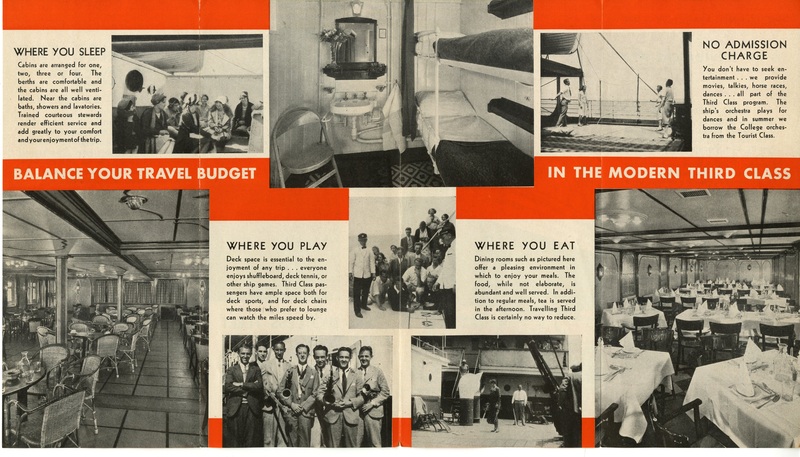 The following 4 images are from the S.S. United States. 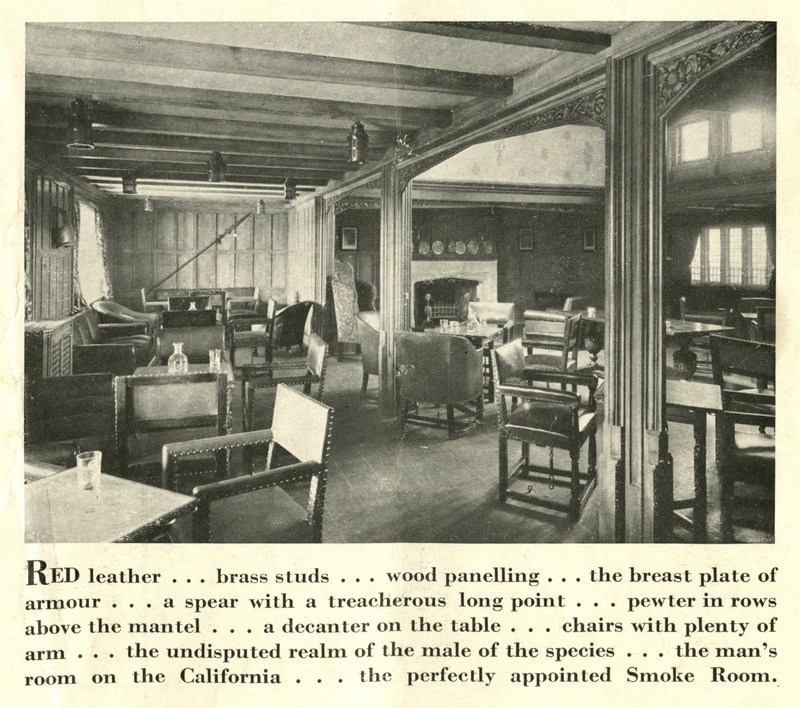 Here’s an image of the dining room. Very red. I would pass on the “Kangaroo Tail Soup.” Hey, the kangaroos need their tails not me. More red. A whole room dedicated to smoking. It was a different time indeed. Oh, my. 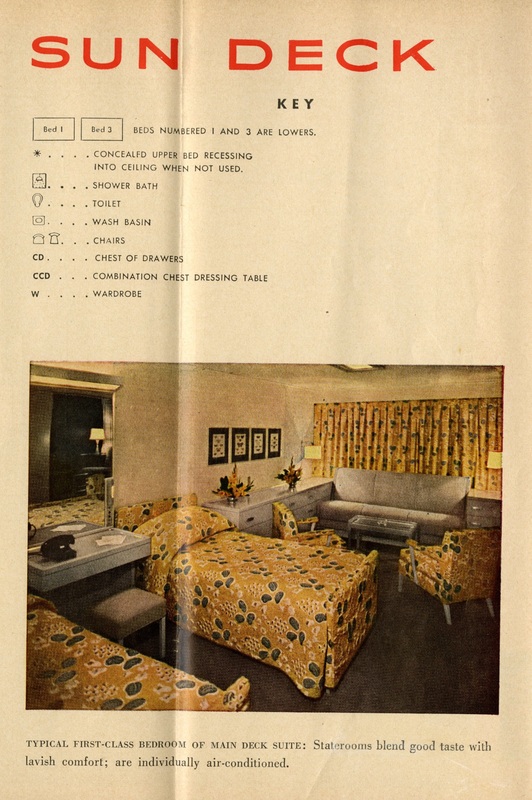 The gay decorator must have been on a break when this bedspread, those chairs and the curtains were approved for this suite. I hope I don’t sound catty. Too late? 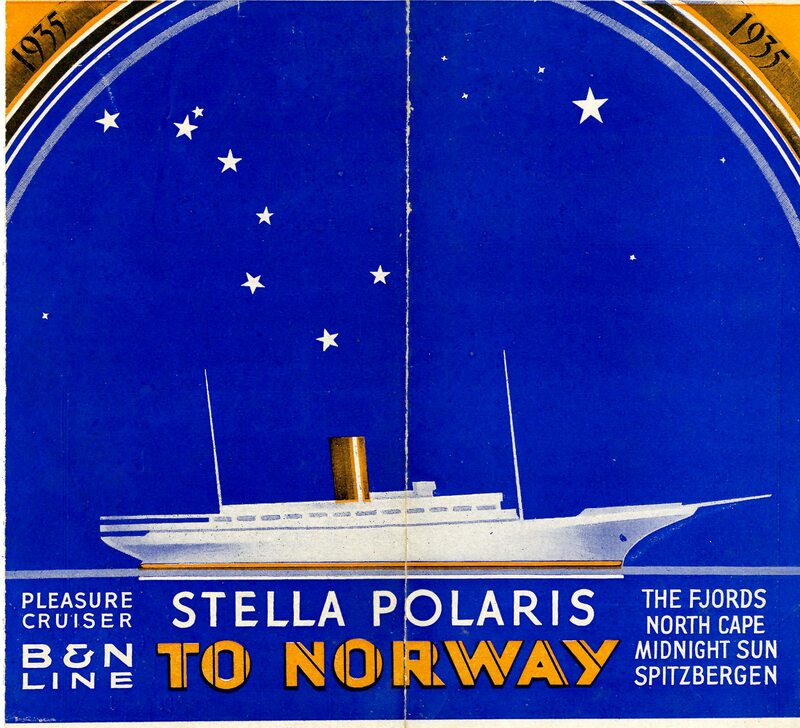 I like this image of the ship from within the brochure. 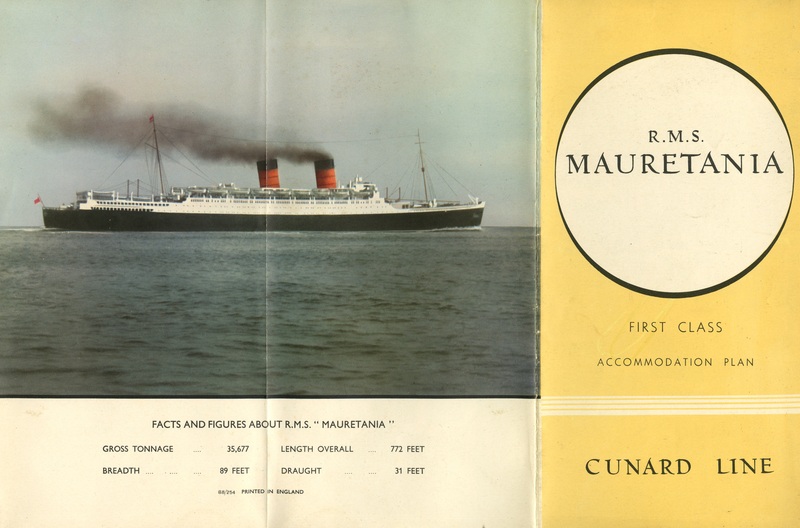 R. M. S. Mauretania brochure. 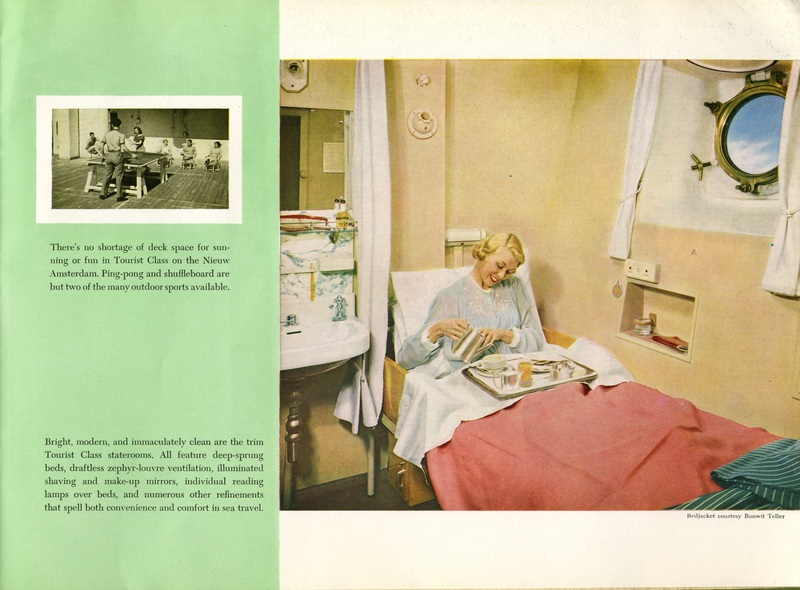 These brochures were very detailed. 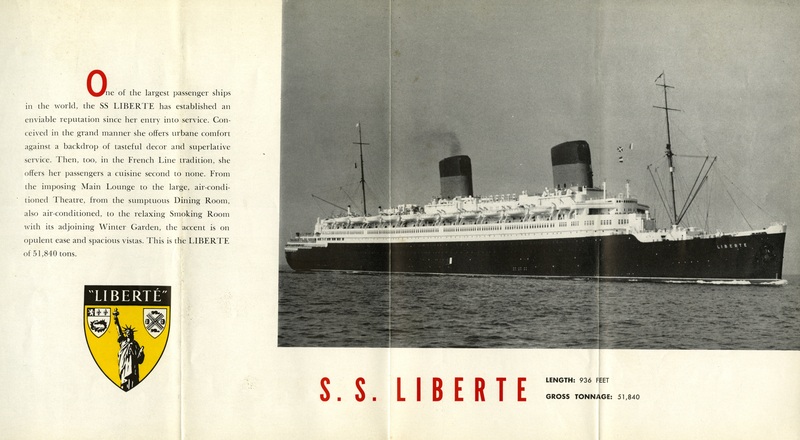 The second Mauretania (with two stacks) from 1939. 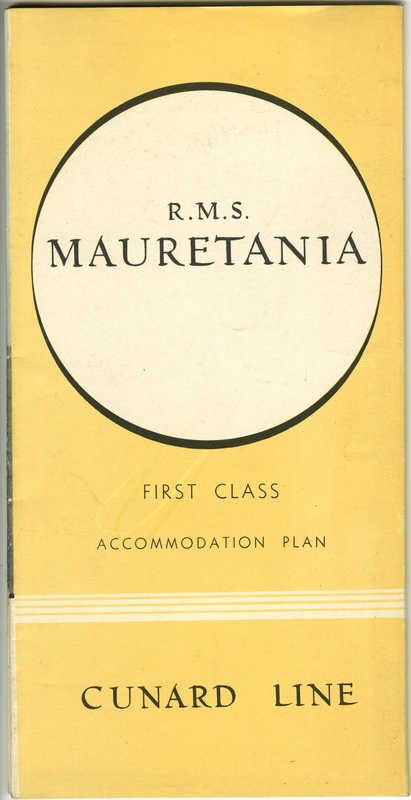 The Mauretania‘s First Class Restaurant. 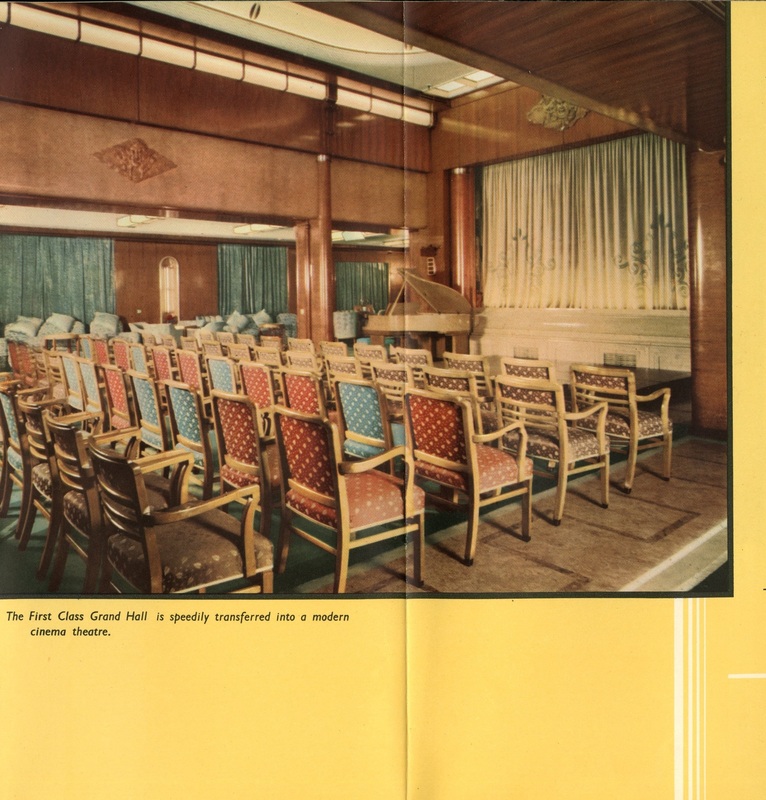 First Class Grand Hall (which can be converted to a movie theater). 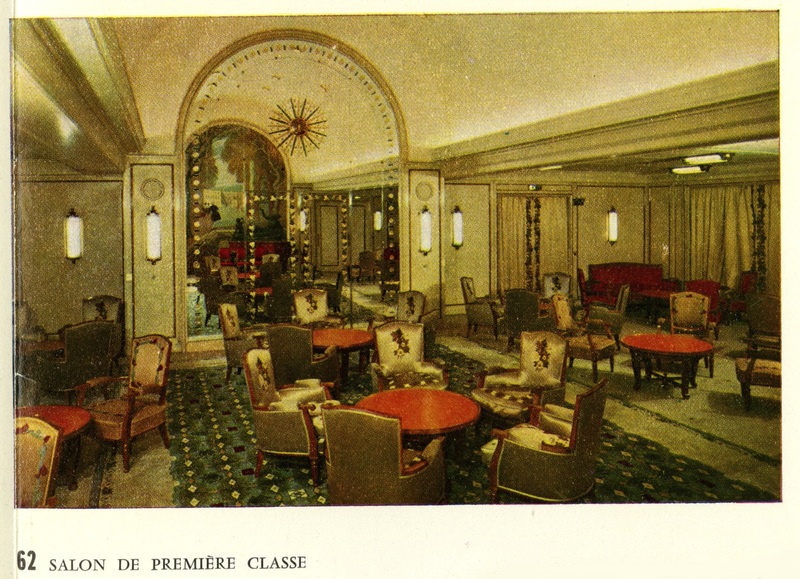 The Mauretania‘s 1st class lounge. 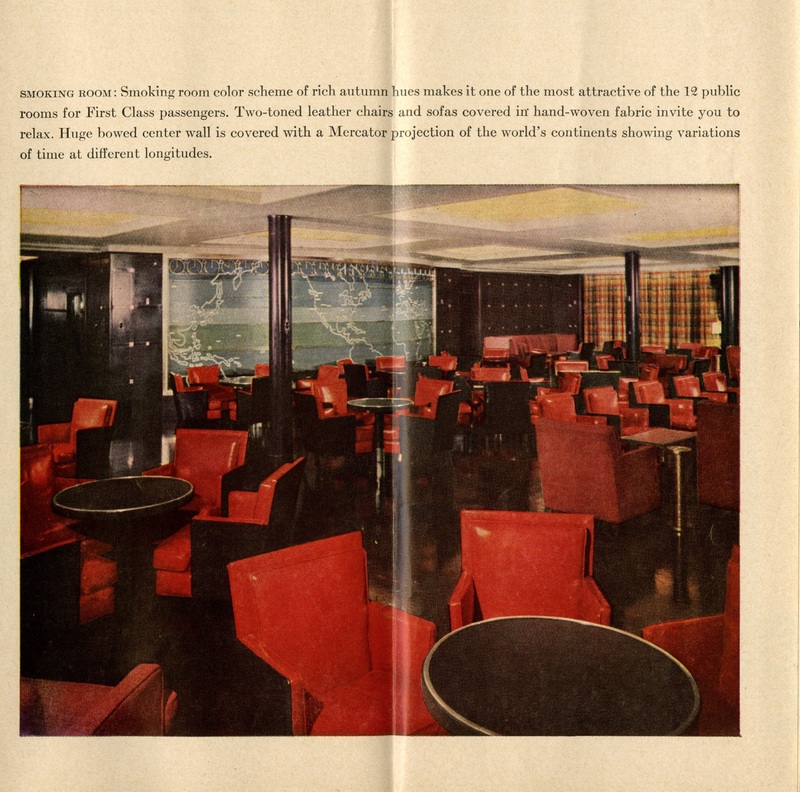 A 1950s brochure for the S.S. Nieuw Amsterdam. 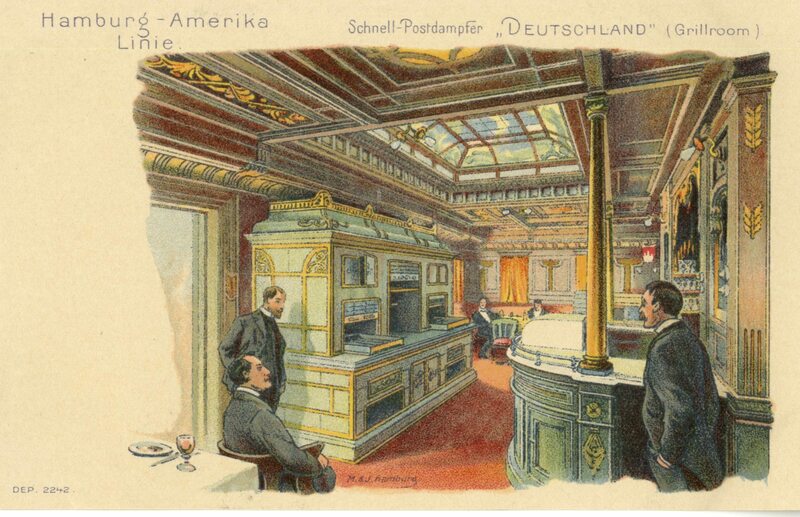 The following 8 images are from the S.S. Nieuw Amsterdam. I’ve seen a number of these brochures and it’s unusual to see the crew depicted. 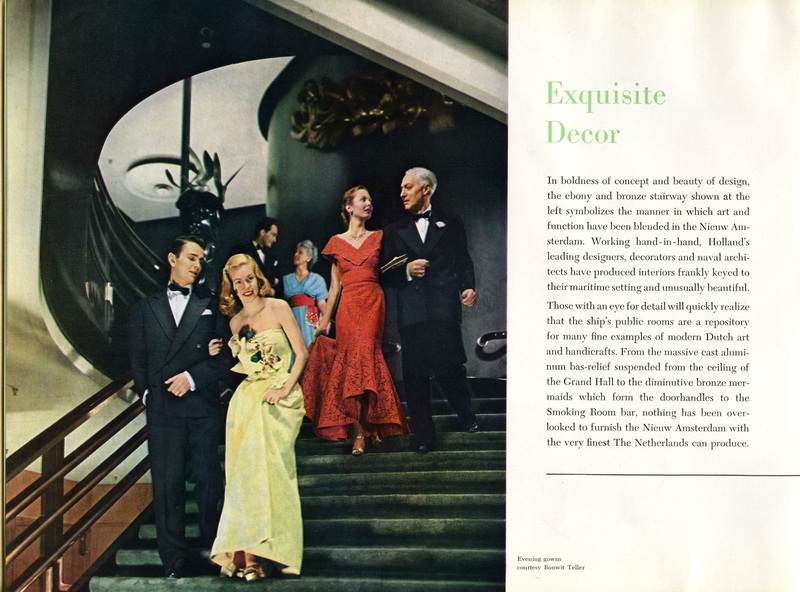 It looks like they’re selling glamour. 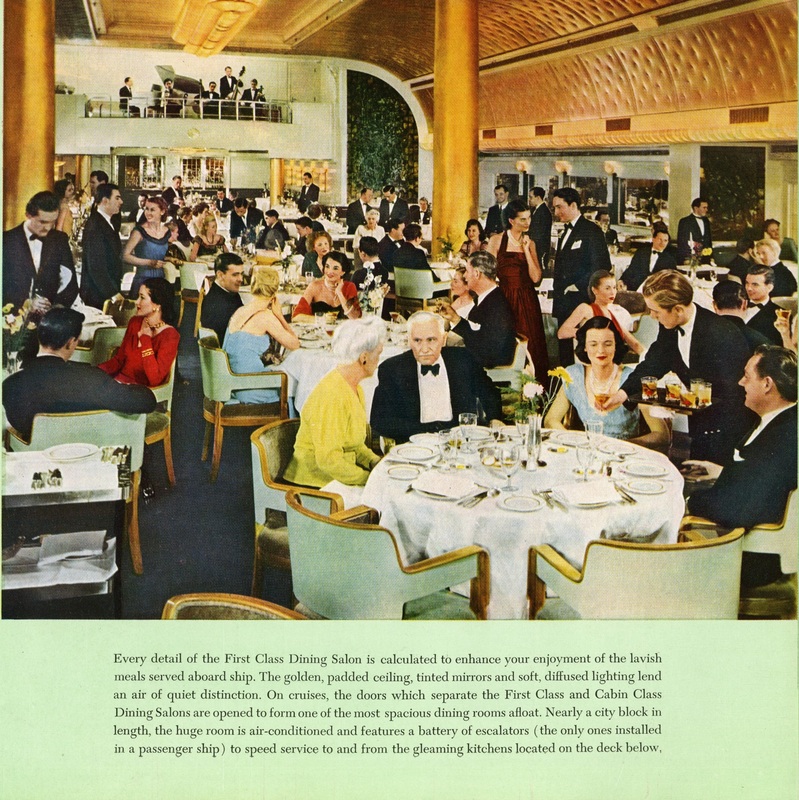 Here’s the first class dining salon. 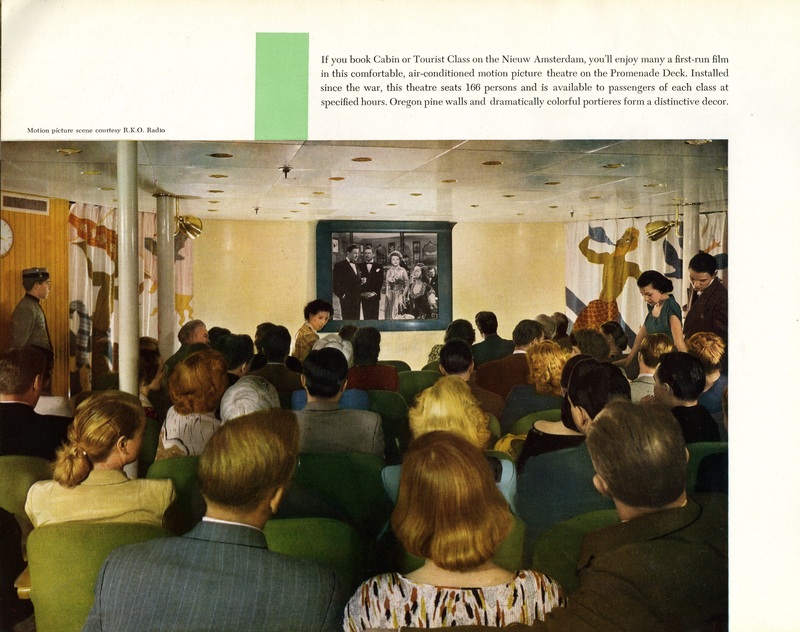 The first class screening room. Okay, this is still part of first class. Now, I included this photo because I find it odd. These people are inside. The guy is sitting very close to these women and he has his shirt off. I find that odd. If it was a married couple – not so weird but a guy and three women – weird. If they were out by the pool – not weird at all. Maybe, I’m just provincial. Cabin class with zodiac wall plaques! Tourist and Cabin class film viewing on a very tiny screen. 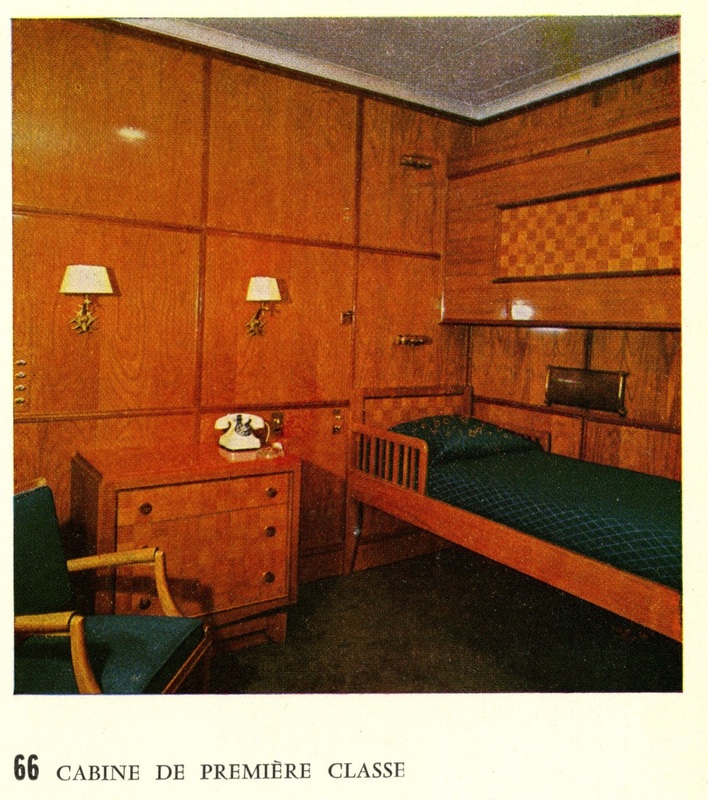 Cabin class. If I were her I would ring for the steward and ask him to pour my tea for me. 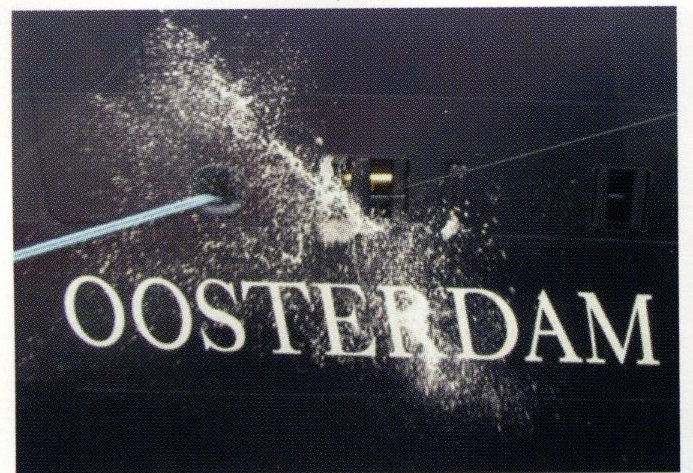 I bought this postcard years ago. That’s the Kaiser Wilhelm II depicted. 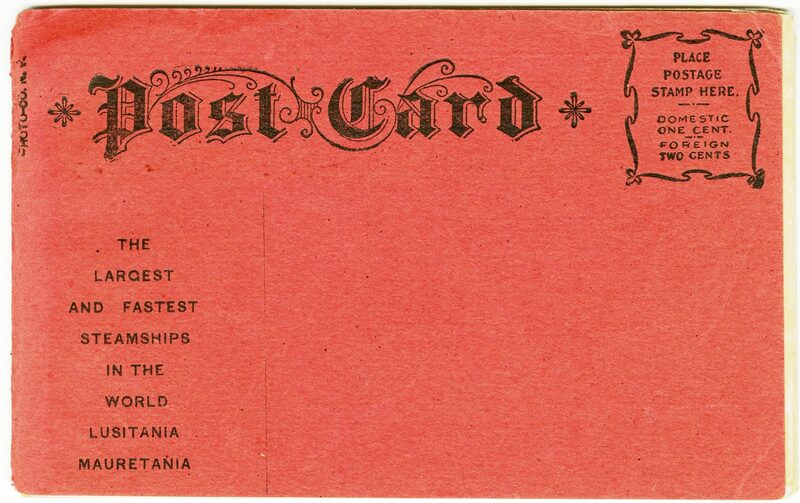 The card is from the Columbian Exposition which was held in Chicago in 1893. 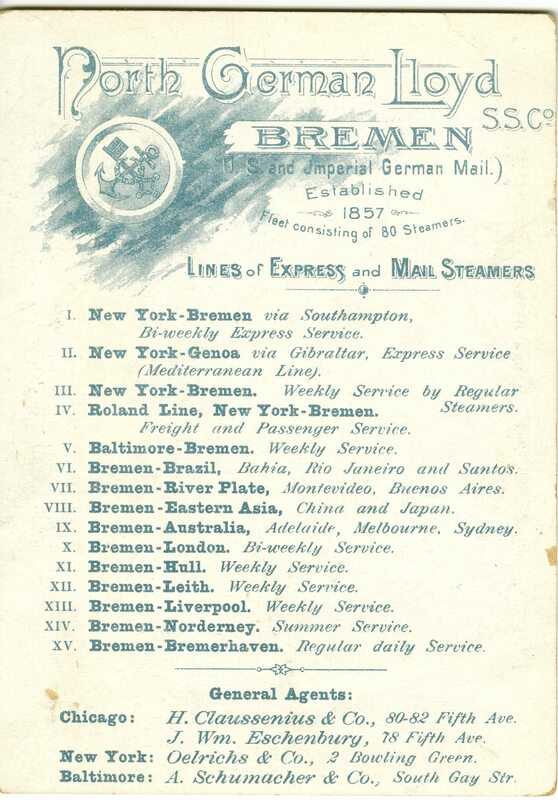 This is the back of the Kaiser Wilhelm World Exposition card. I think I like the back even better than the front because of the graphics and the text/typeface. This appears to be a “trunk” label. 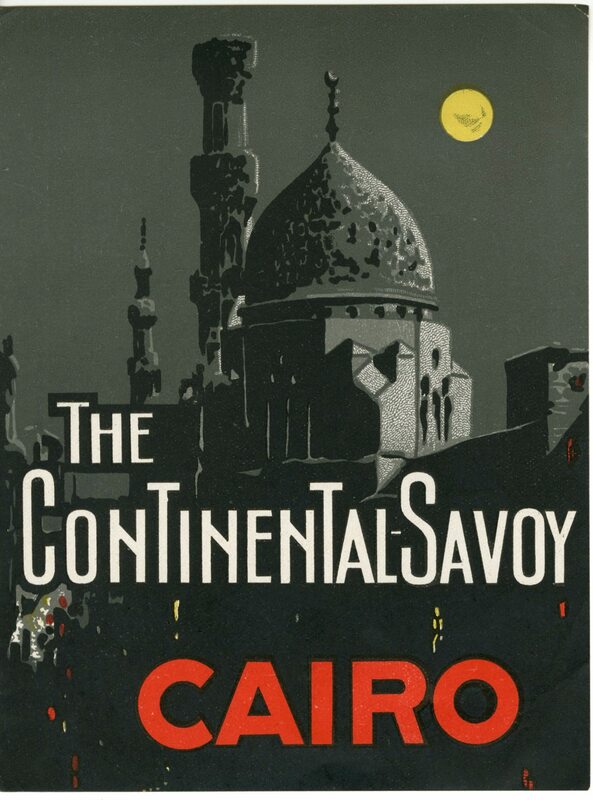 It’s a super label and I would love to stay at the Continental Savoy. 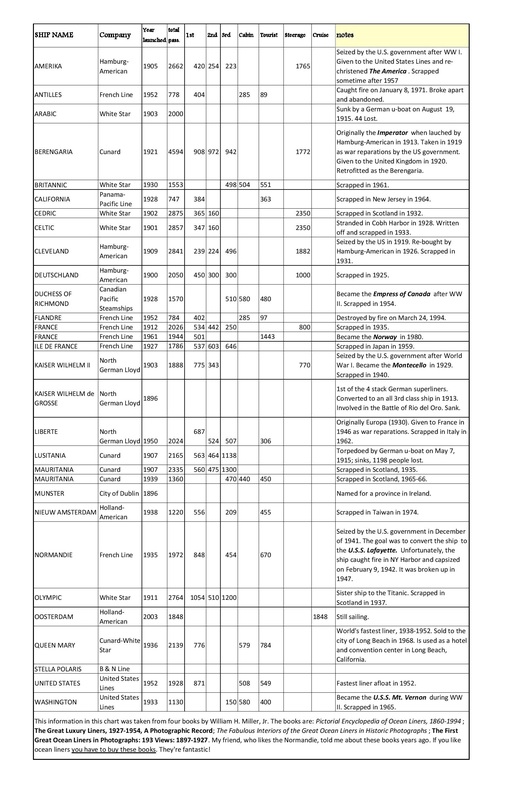 Here’s a chart I made up of all the ships depicted in this post. I went to San Francisco in 2015. 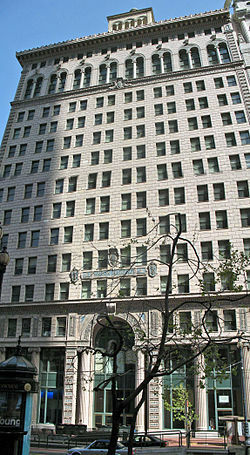 While walking to the Ferry Building I saw this building. 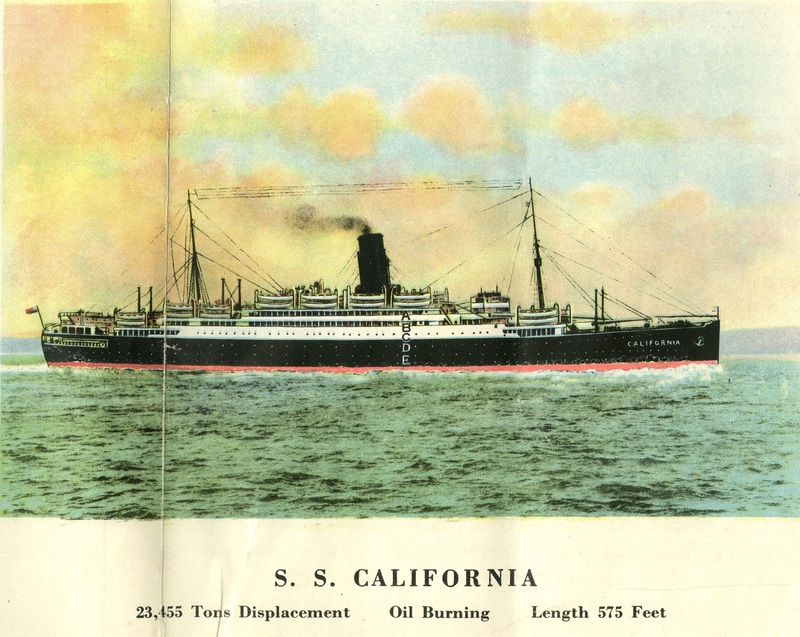 The Matson Line had ships that sailed between the west coast and Hawaii. 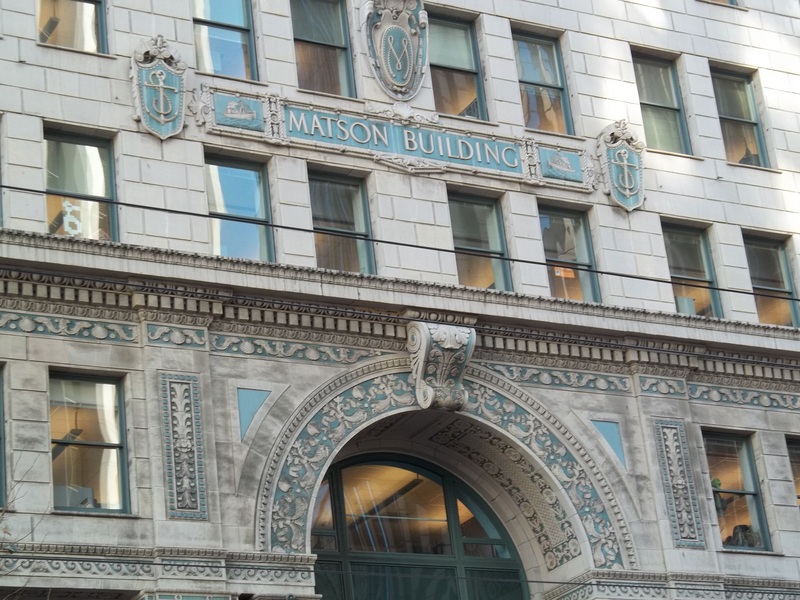 In the ceramic tiles that decorate this building there’s fish, water, seashells, anchors, steamships and rope. 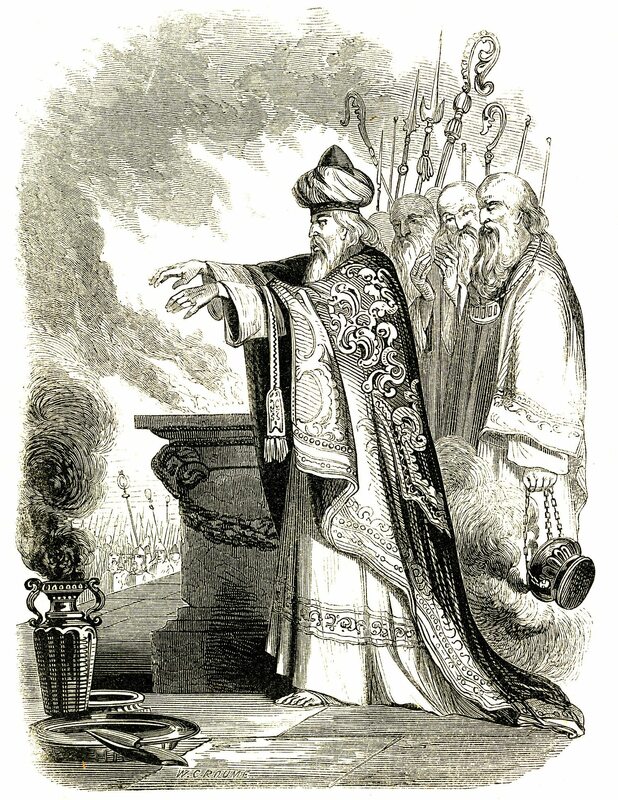 This is an image from Wikipedia. Wikipedia was able to get the whole building in the shot –something I wasn’t able to do. I didn’t go into the building because it was closed but that’s on my “to do” list next time I go to San Francisco. I was looking through some architectural journals in December of 2015 and found this drawing. 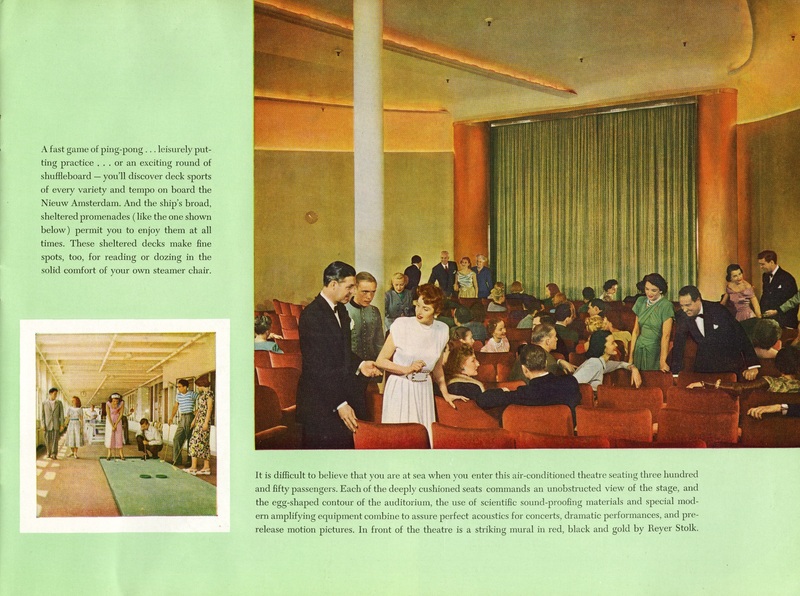 I found this cool little brochure on Panama cruises online. I really like that image of the ship in the second panel. It makes me want to sail 3rd class. 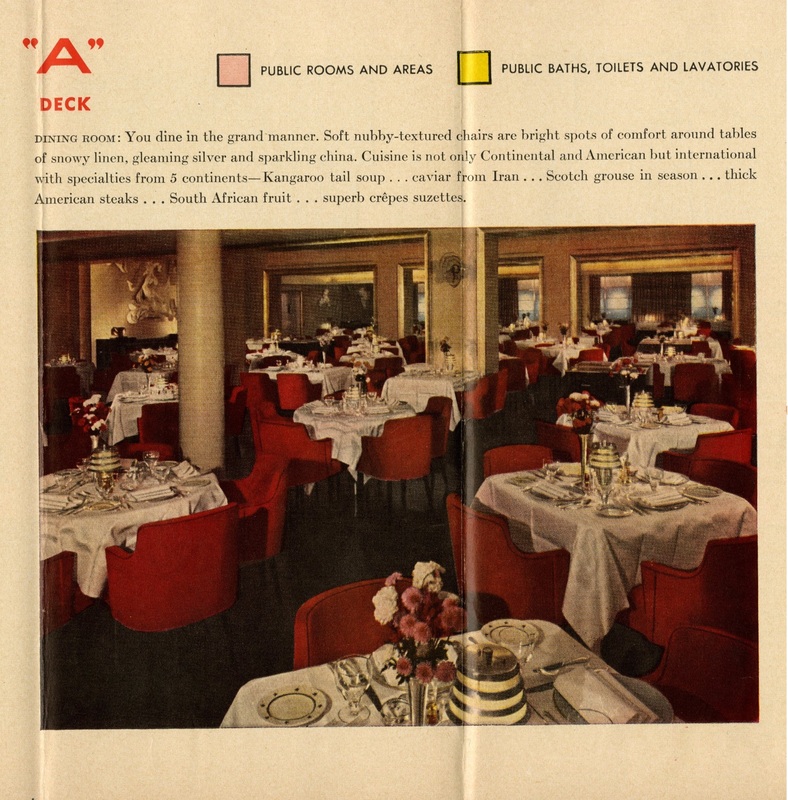 The interior of the 3rd class brochure.